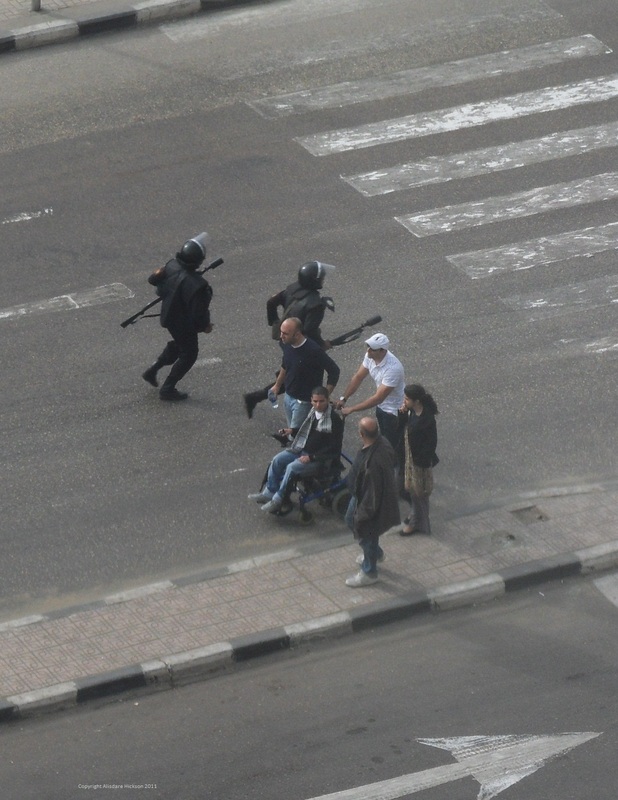 Late morning on Angry Friday 28 January 2011 and the first group of protesters to enter Tahrir Square is led by a man in a wheelchair carrying a placard. 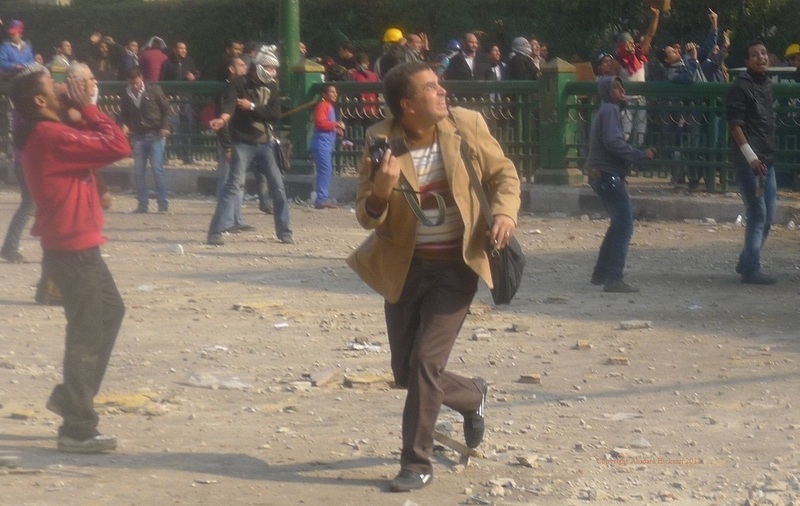 He briefly lowers it as security forces rush towards and then past him. 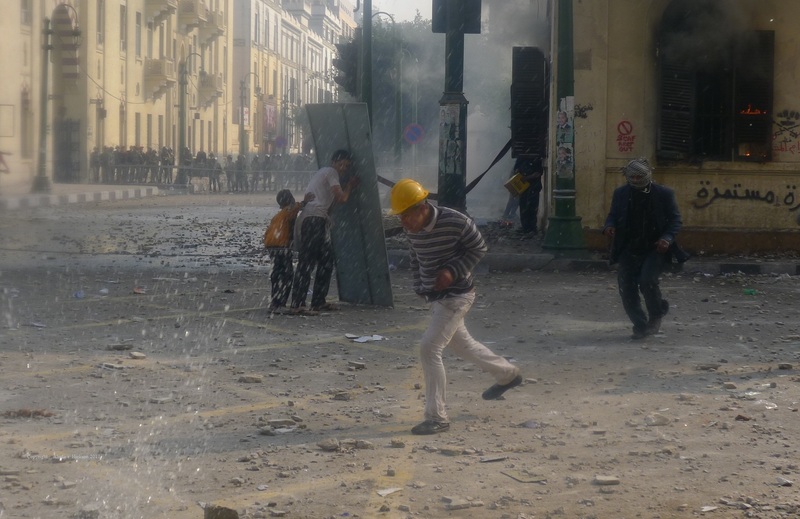 Photograph taken from the City Hotel near the corner of Tahrir Square and Bustan street. 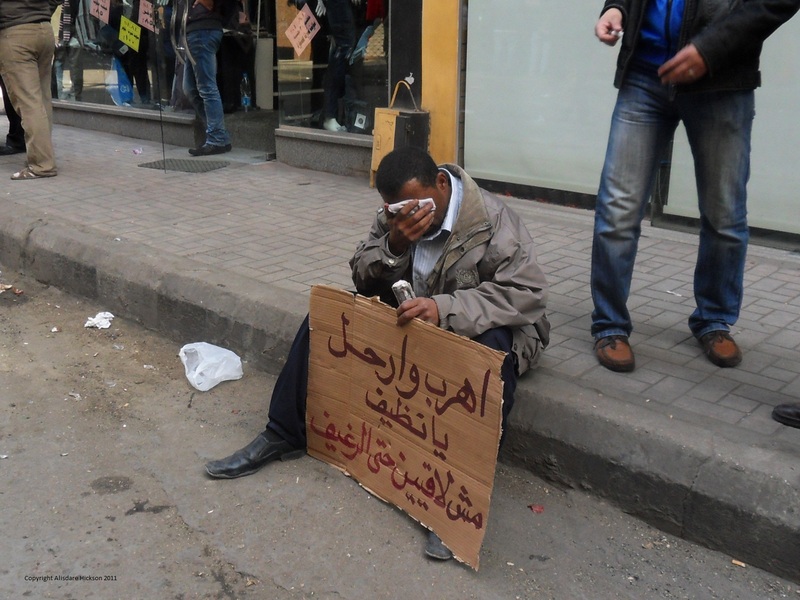 Angry Friday Afternoon – a man suffering from tear gas exposure sits on the pavement of Marouf Street near the junction with Talaat Harb. 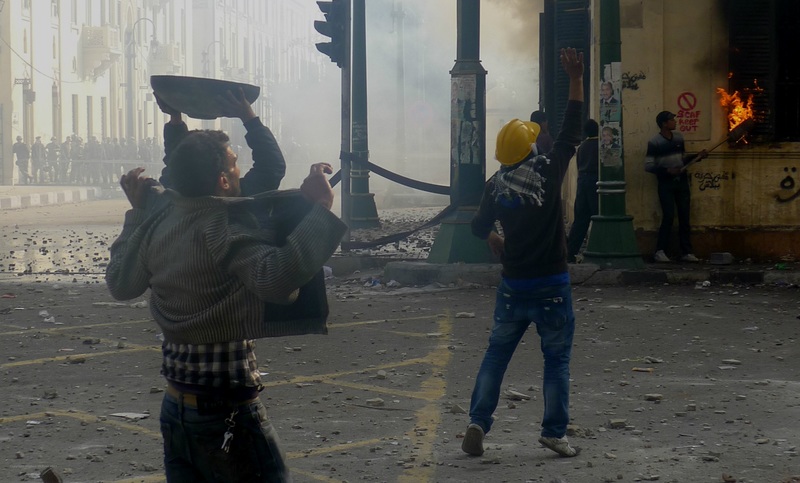 Angry Friday Afternoon 28 January 2011 – a tear gas cannister bounces along Talaat Harb and it’s almost as if the mannequins in the shop window are watching. 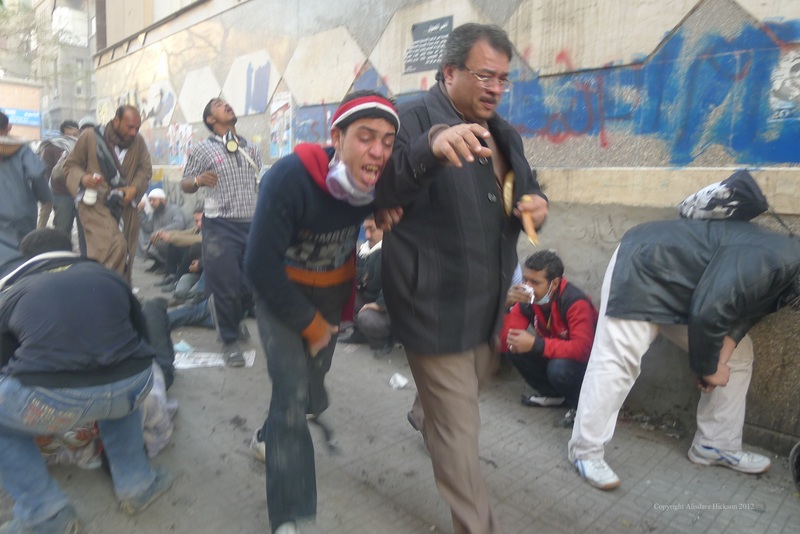 Angry Friday Afternoon 28 January 2011 – Talaat Harb in Downtown Cairo – one man tries to pick up a smoking tear gas cannister while in the background pedestrians scatter. 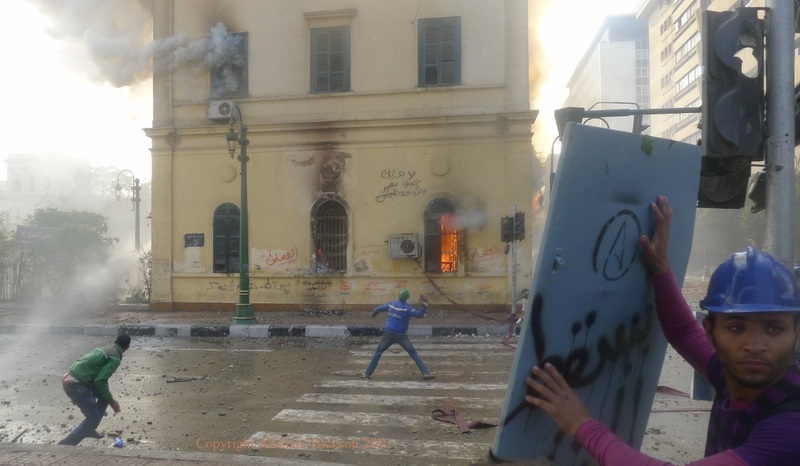 The NDP building was set alight on the evening of 28 January 2011 and was still burning on Saturday morning. 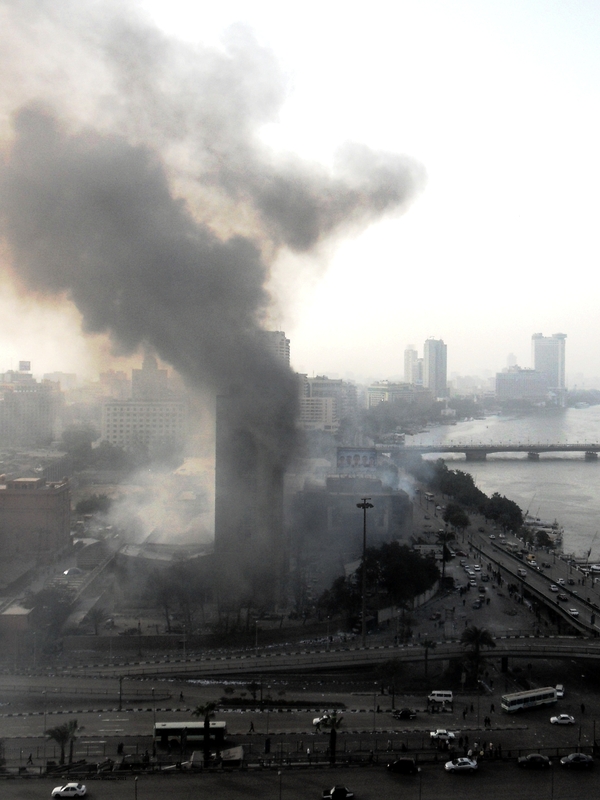 This photograph was taken from the fifteenth floor of the Ramses Hilton Hotel. 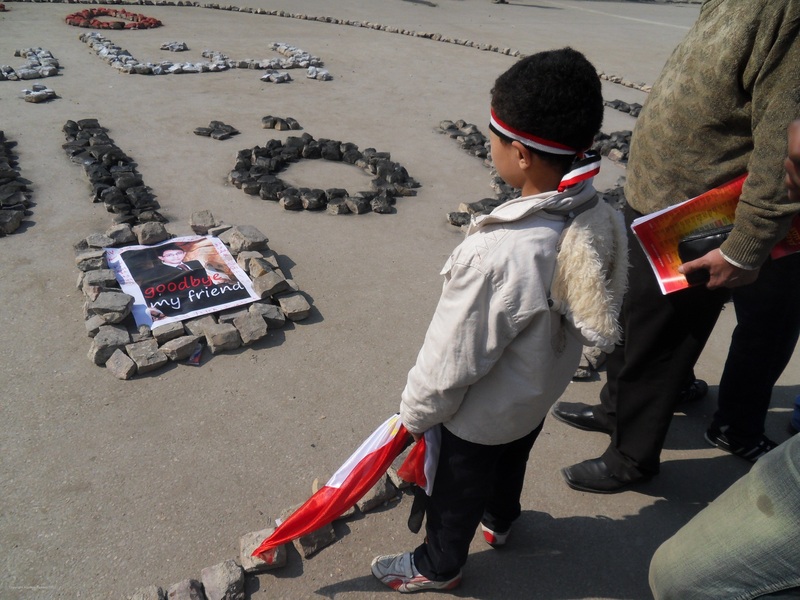 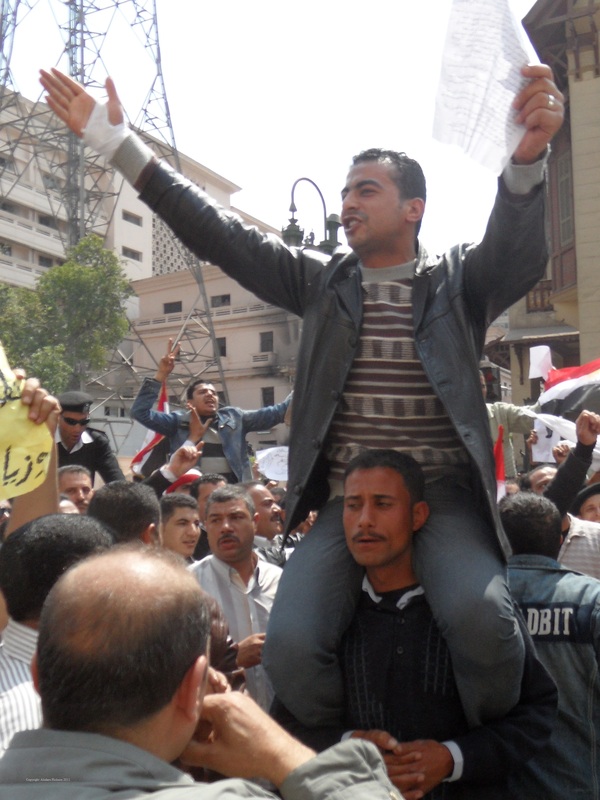 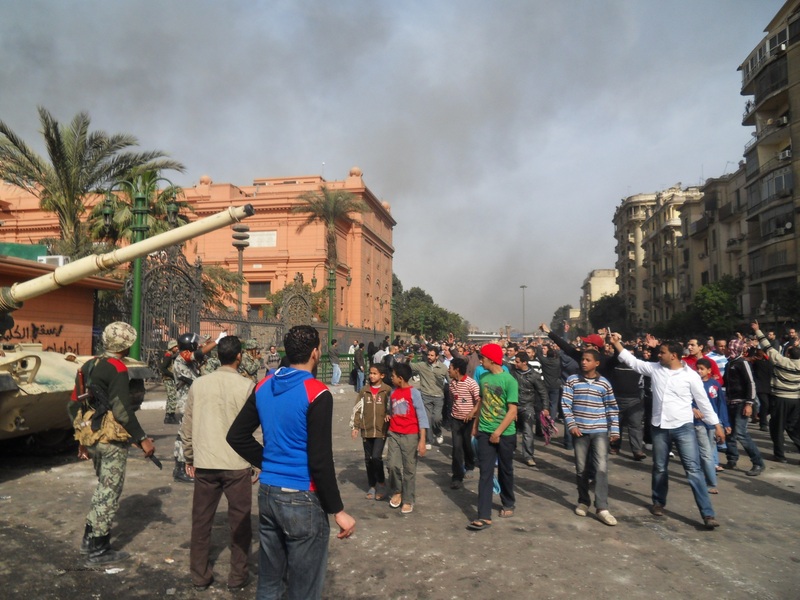 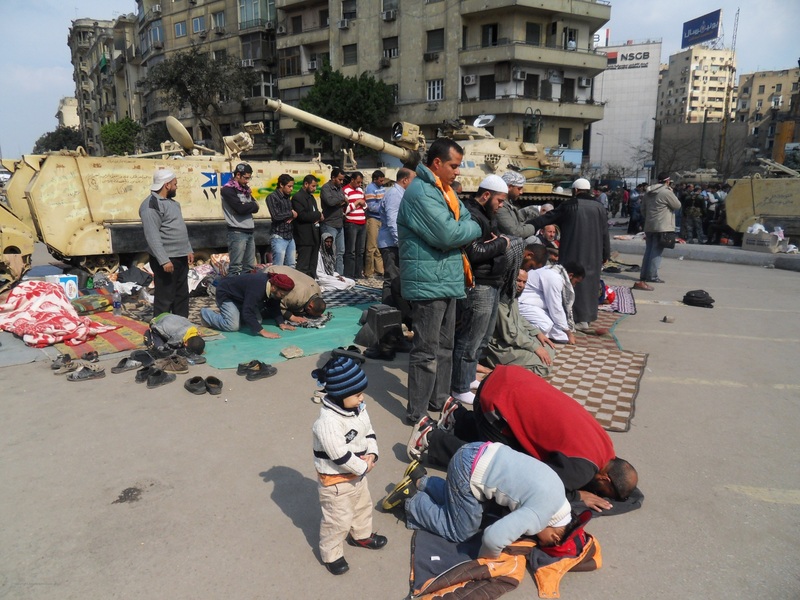 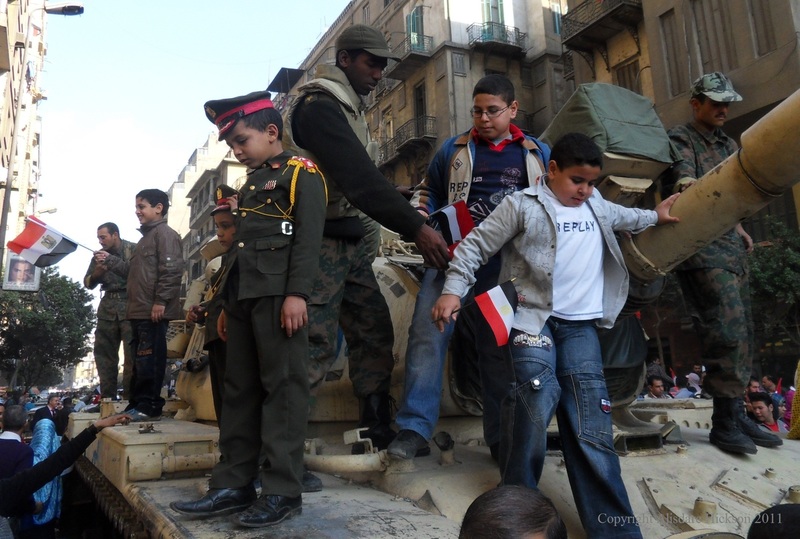 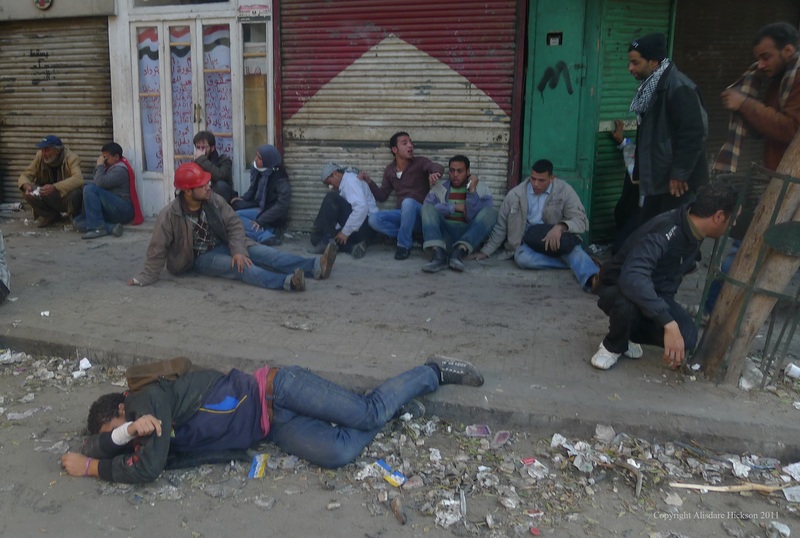 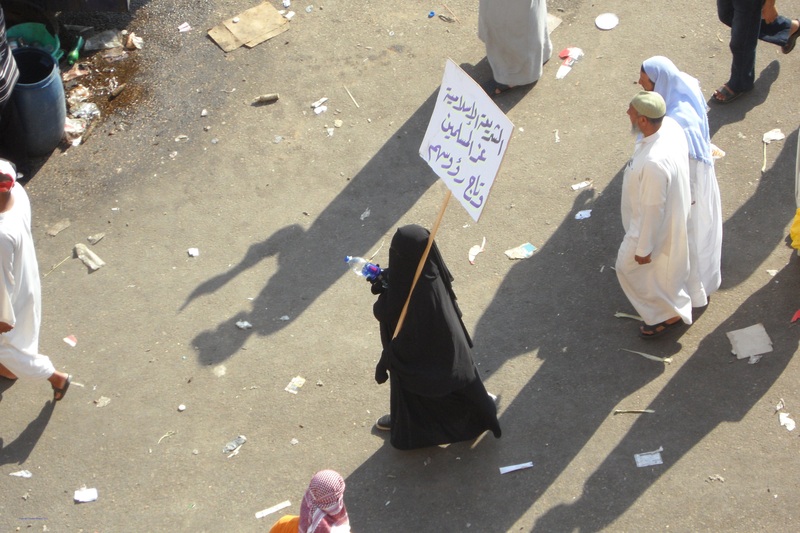 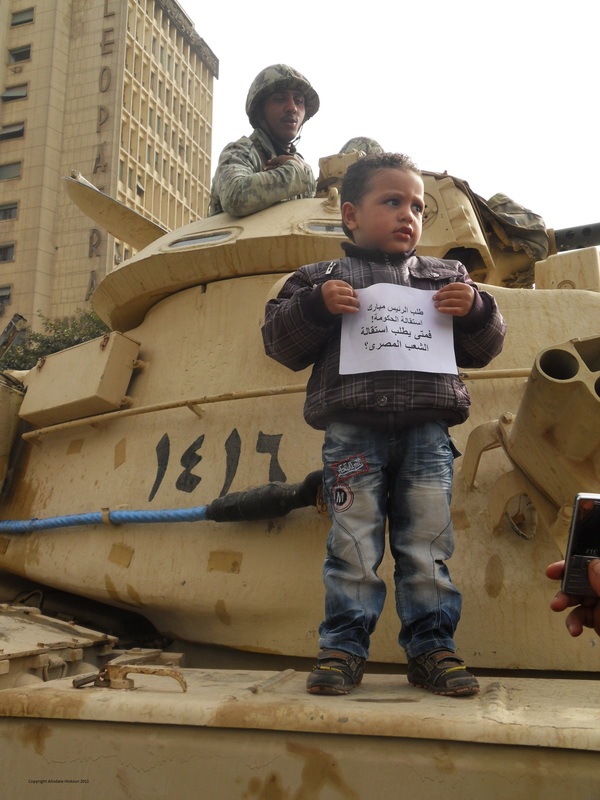 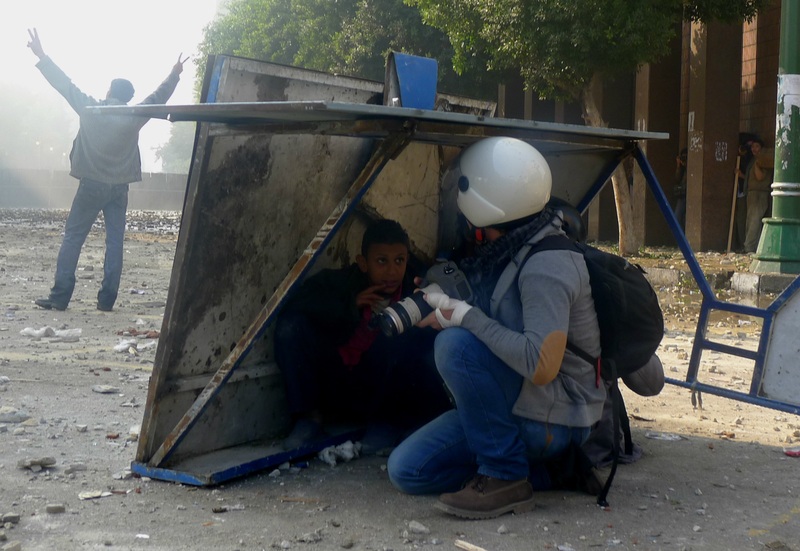 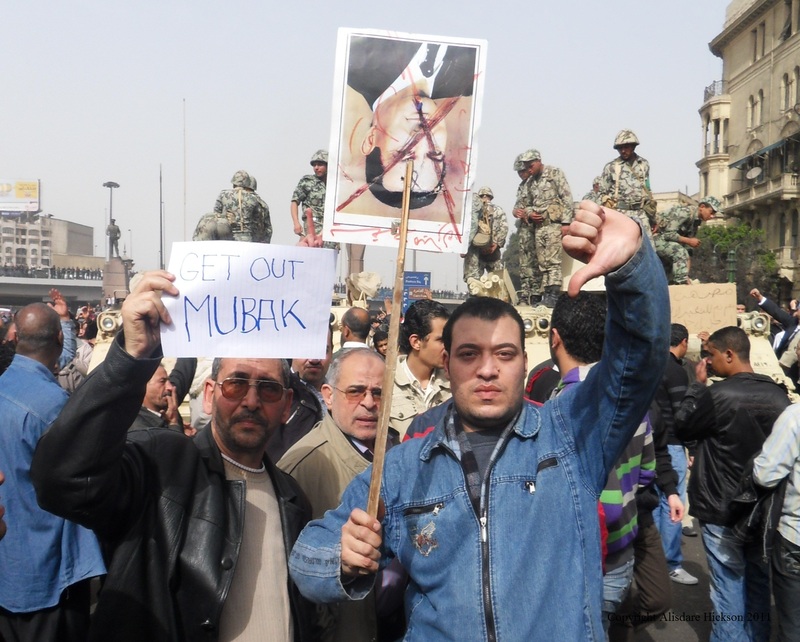 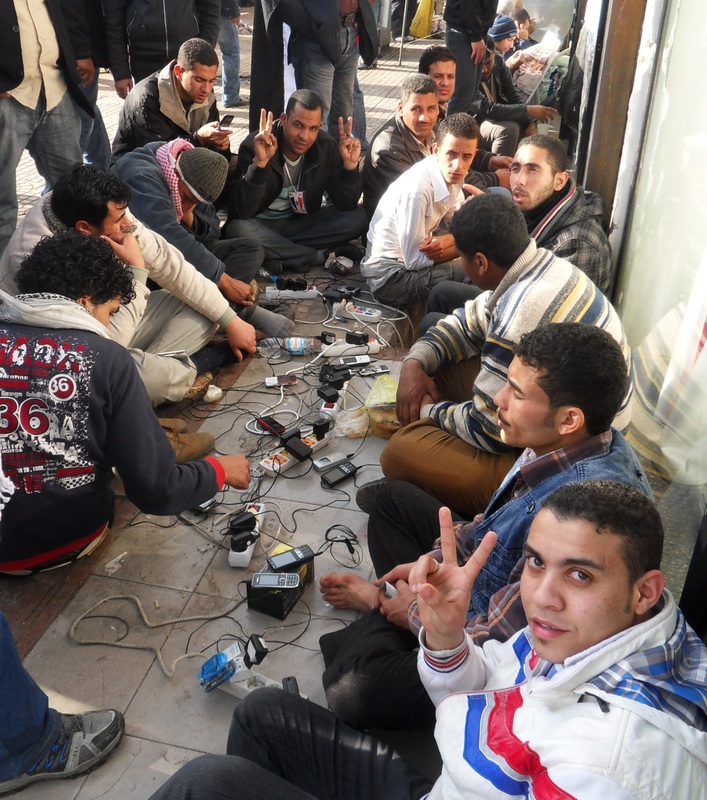 Late morning Saturday 29 January – the first group of protesters led by a boy advance on Tahrir Square. 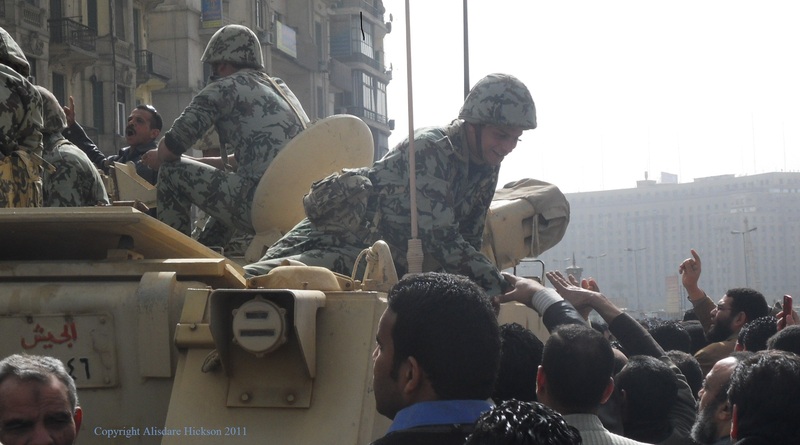 Early afternoon Saturday 29 January 2011 Soldiers block the road from Tahrir Square that leads towards the parliament. 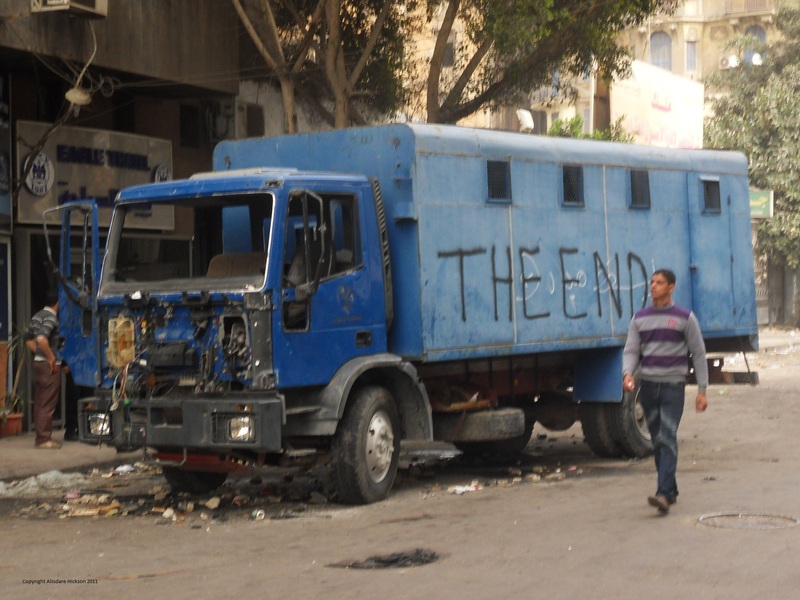 A Burned out police van in Bustan Street just off Tahrir Square – Saturday 29 January 2011. 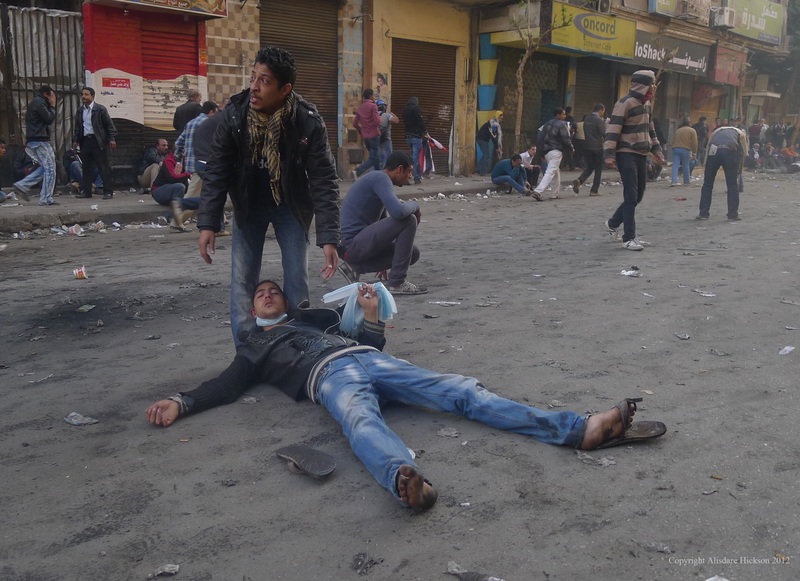 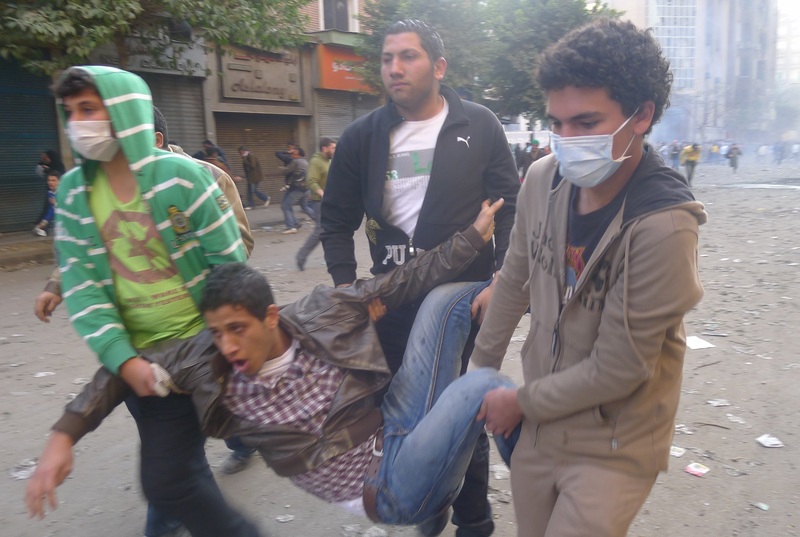 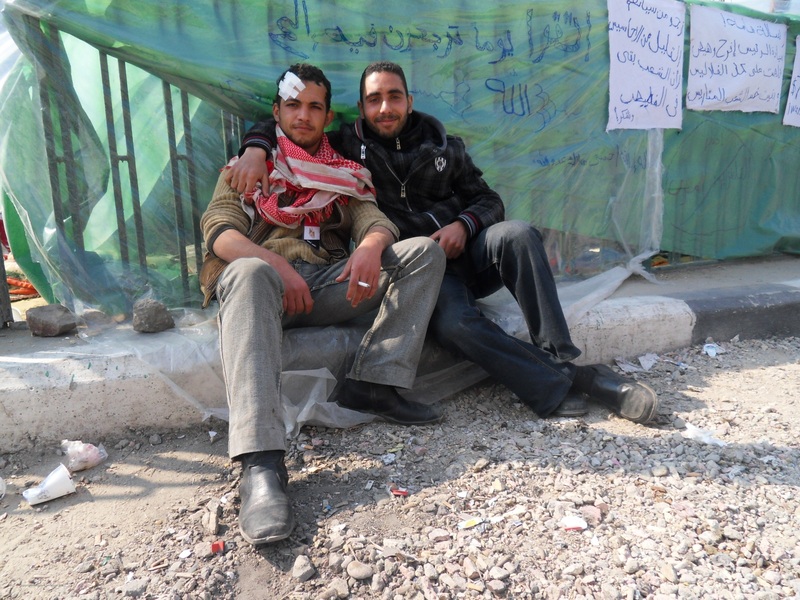 8 January 2011 – Tahrir Square – one of many injured protesters. 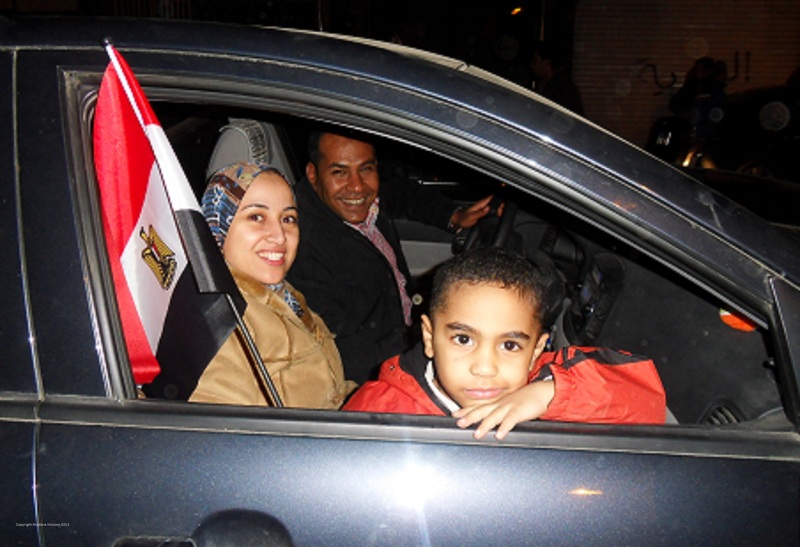 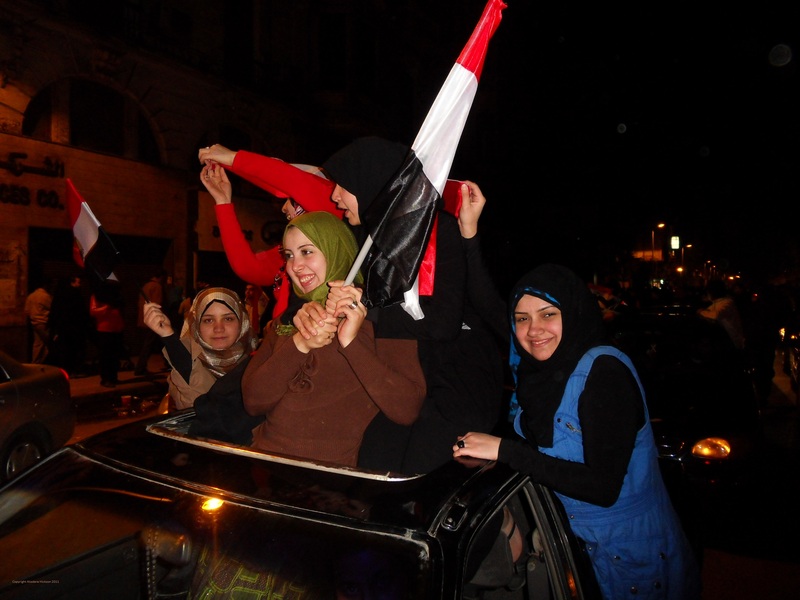 Young women celebrate – Talaat Harb – Late evening 11 February 2011. 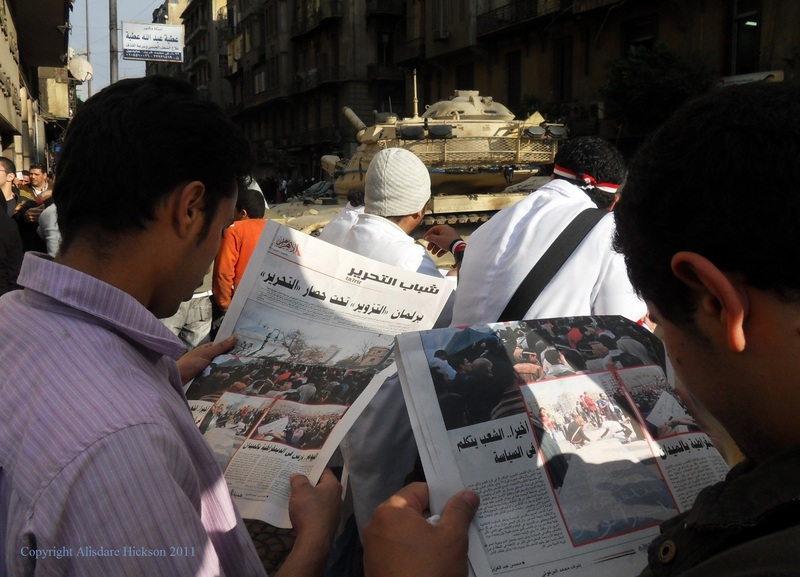 20 July 2011 – This photo taken in Talaat Harb less than 100 metres from Sadat Station and Tahrir Square. 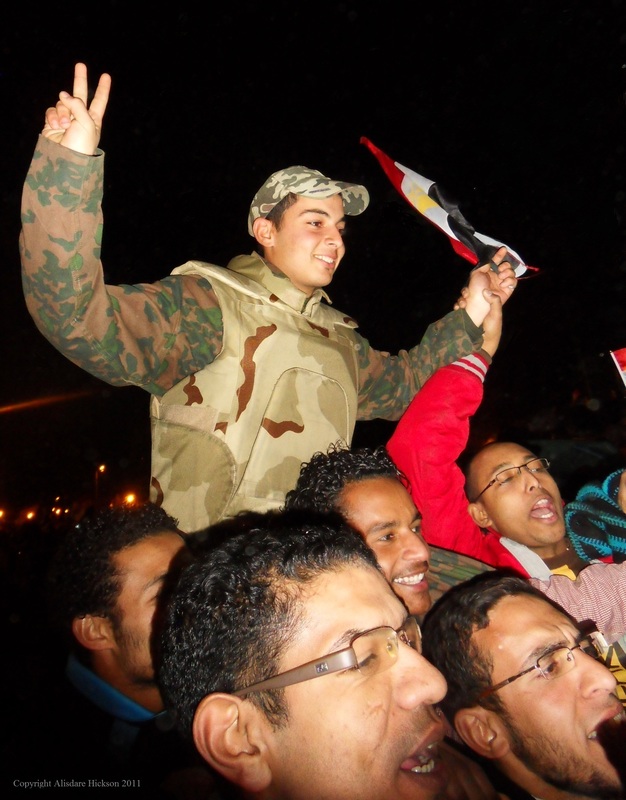 In this case the trader who is selling revolution souvenir T shirts was also a participator in the original uprising. 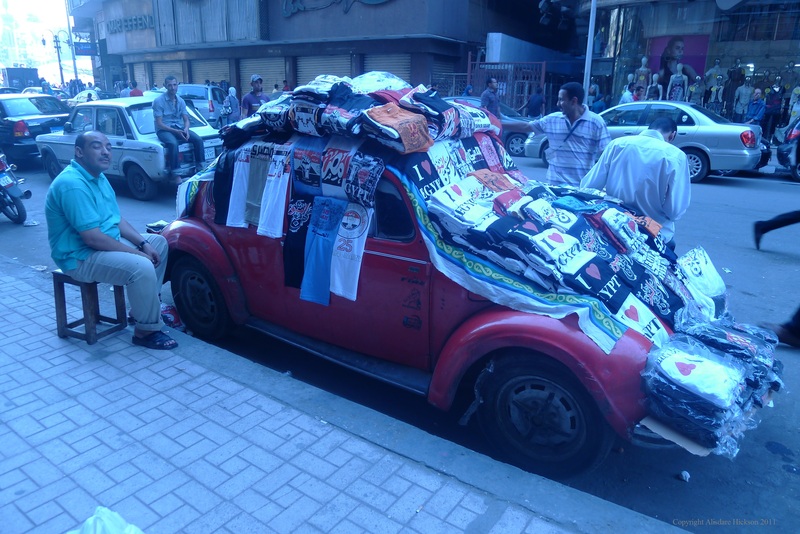 I had seen his red Volkswagen Beetle earlier in the square acting as an anchor to part of a tent not far from the Square’s mosque in February. 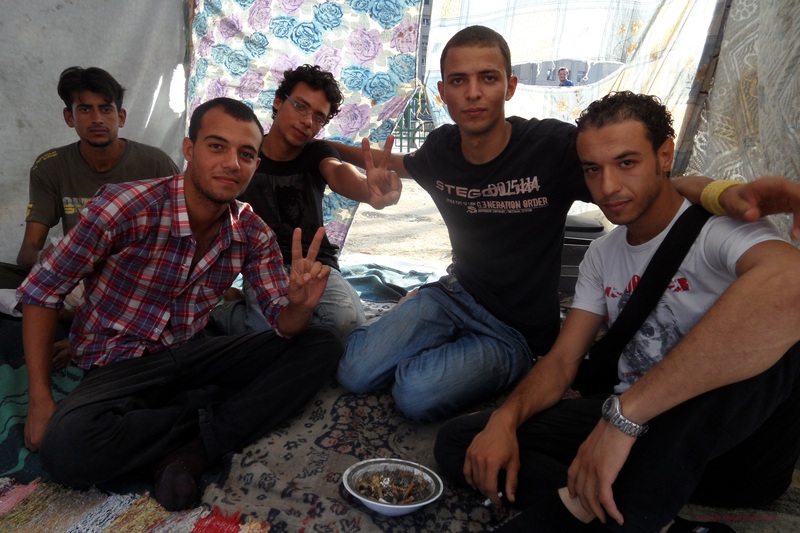 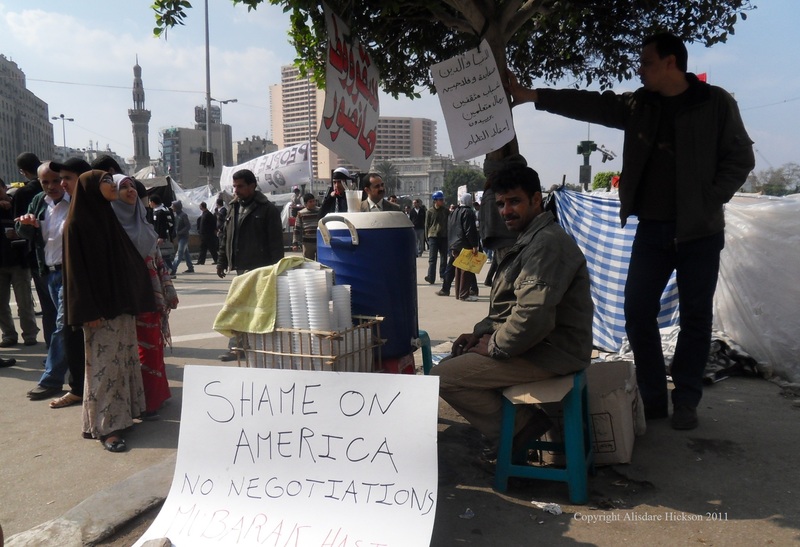 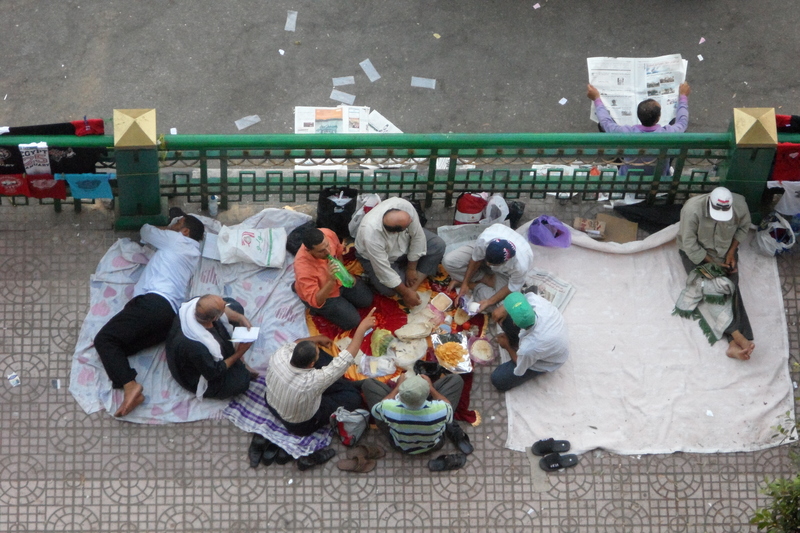 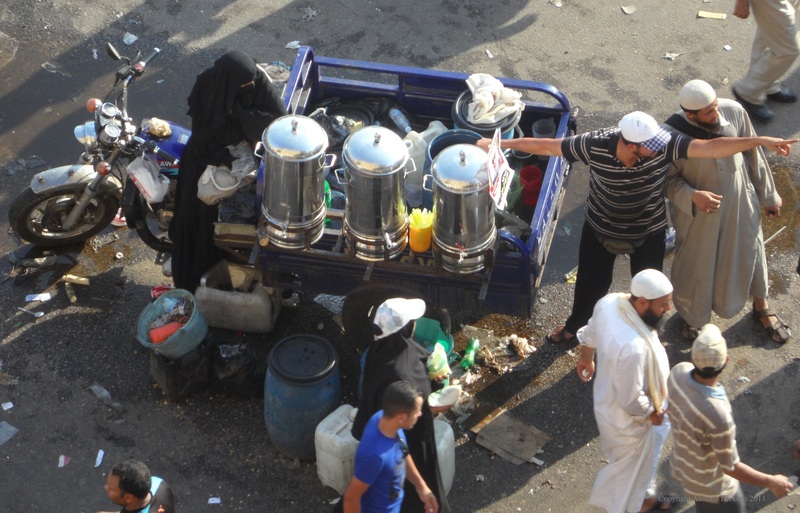 Tahrir Square breakfast – 29 July 2011 – morning of the large Islamist Rally. 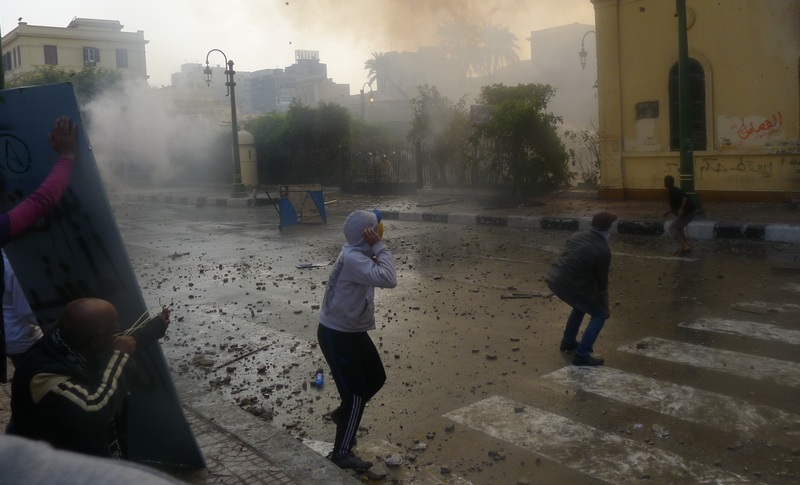 8.20am in the morning of the 17th December 2011. 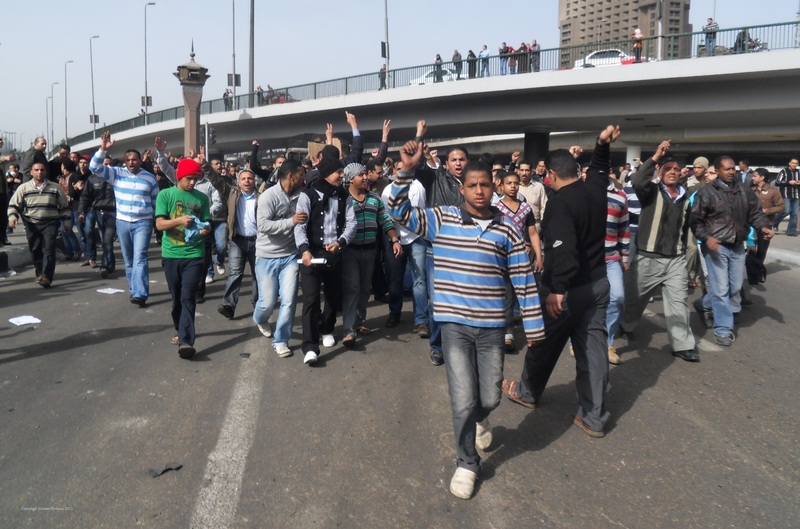 Protests had started due to violence against protesters outside the parliament building a day earlier. 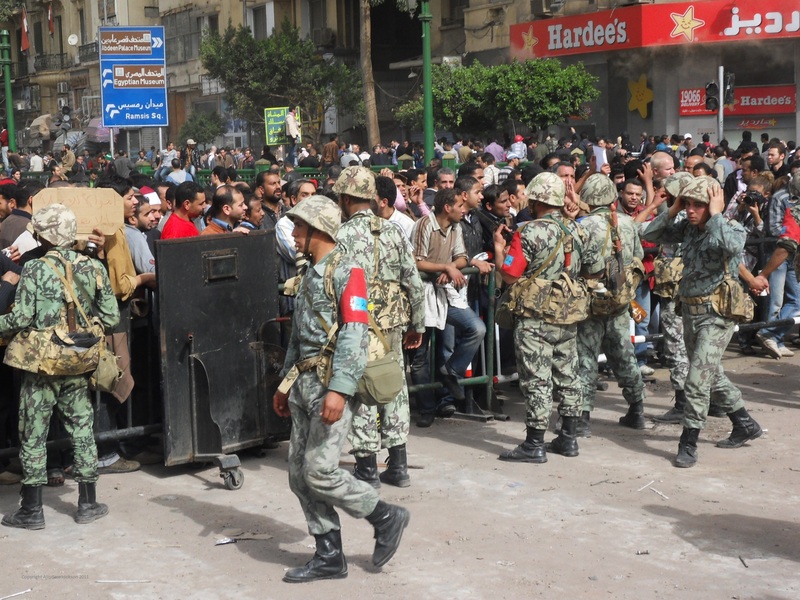 The military had just blocked off Kasr El Aini and a neighbouring street below the Egyptian Insitute. 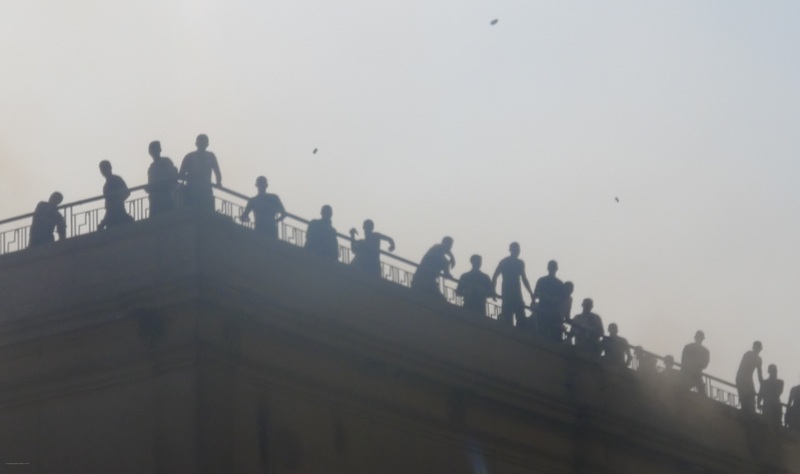 A large number of militia had taken up a position on the rooftop as it overlooked these two points. 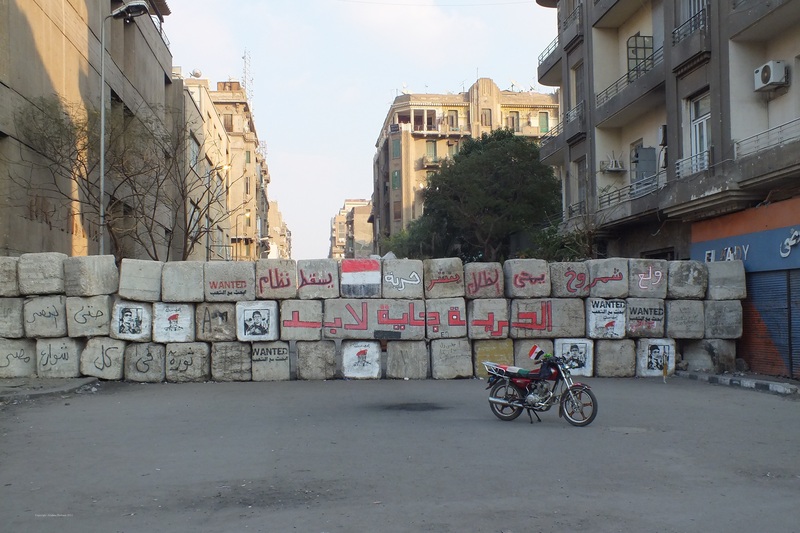 Presumably the government were worried that protesters would be able to make their way from Tahrir Square south towards parliament or east towards the Ministry of Interior. 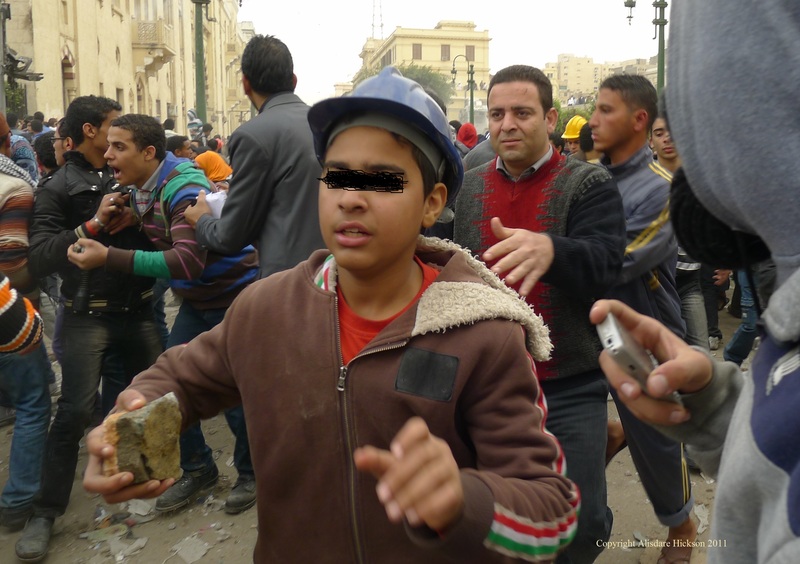 These militia started throwing rocks and concrete slabs of all sizes on to anyone they saw beneath. 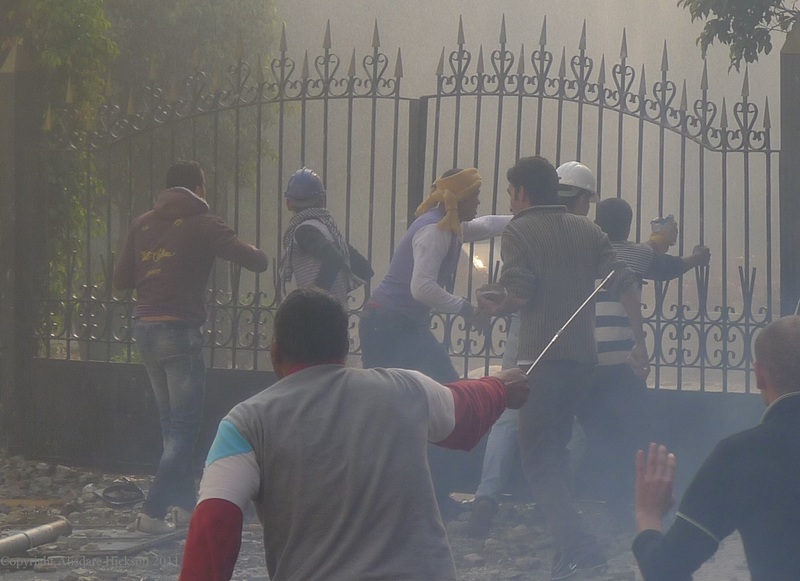 Young men try to relight the fire at the Egyptian Institute. 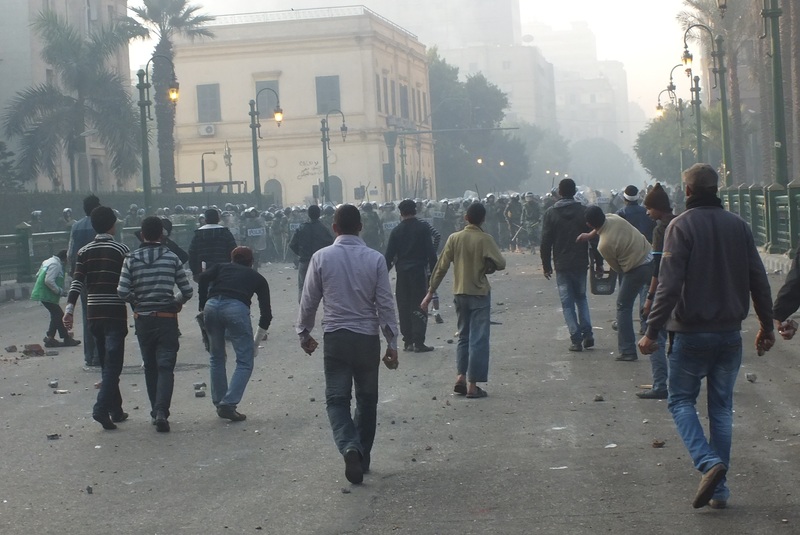 Just after 8am on the morning of 17th December 2011. 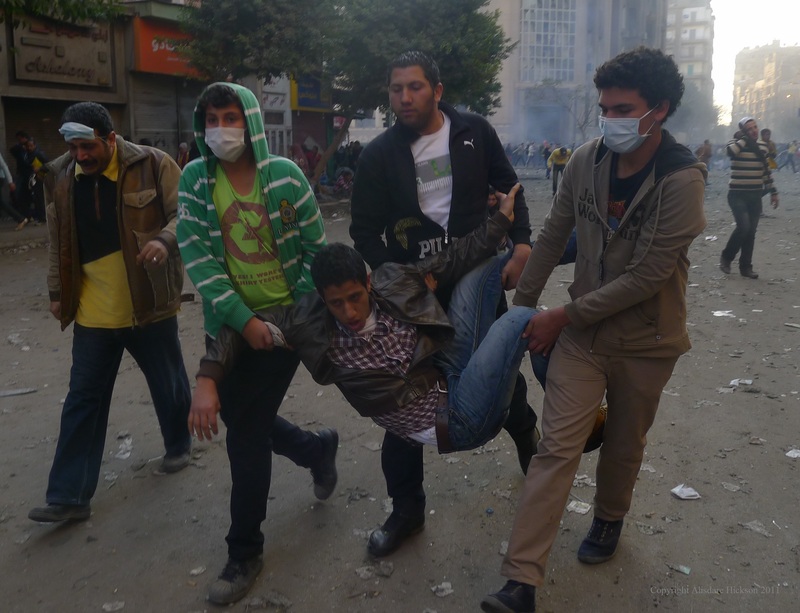 It’s not clear whether these young men were acting of their own accord or had been paid to infiltrate the ongoing protests against military rule. 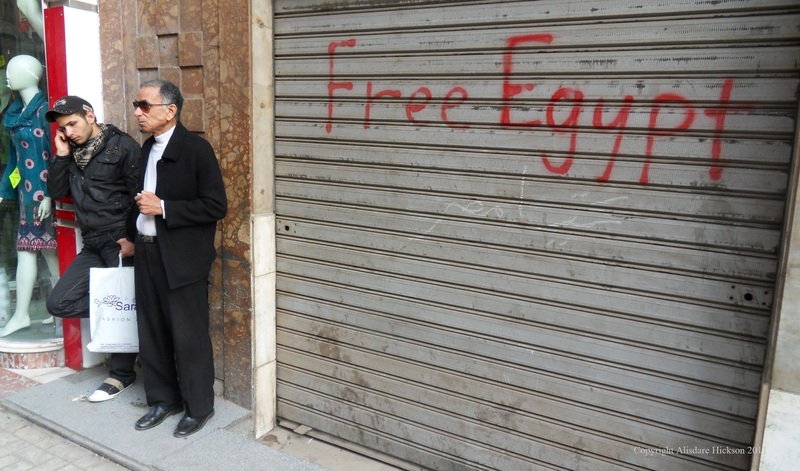 However they came armed with crates of bottles of petrol and repeatedly set light to the Egyptian Institute, the home of thousands of priceless artefacts from Egypt’s history. 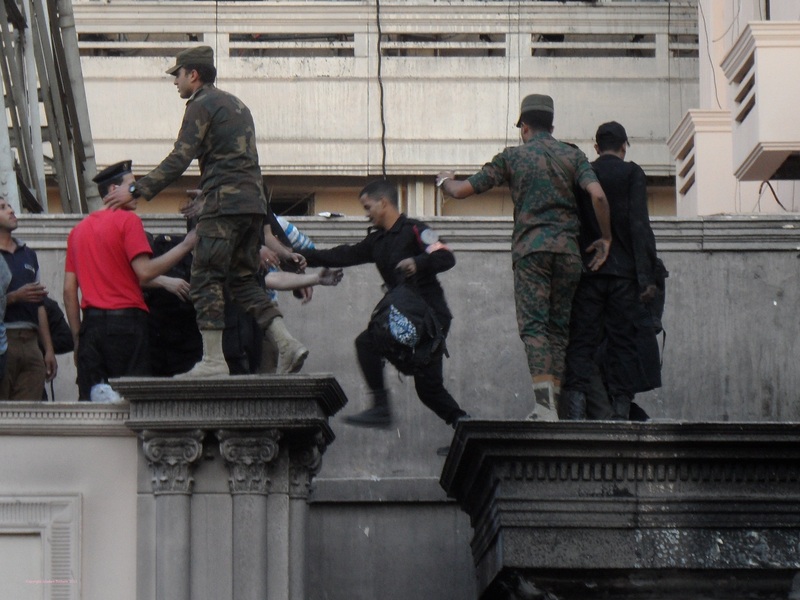 I don’t know whether this had been planned in advance as an attempt to discredit the protesters or whether this was a reckless response by violent elements sympathetic with the protests angered by militia on the roof who had repeatedly been throwing rocks and concrete slabs on to the protesters in the street below. 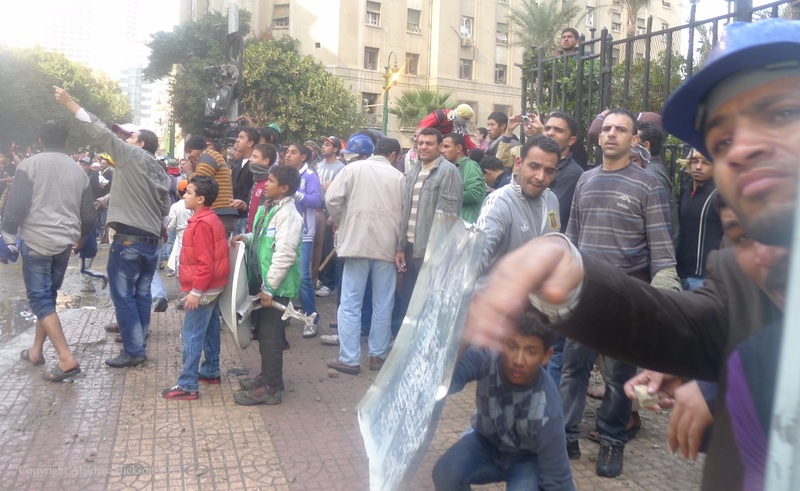 Either way this act of arson threatened many lives and damaged the reputation of the protest movement. 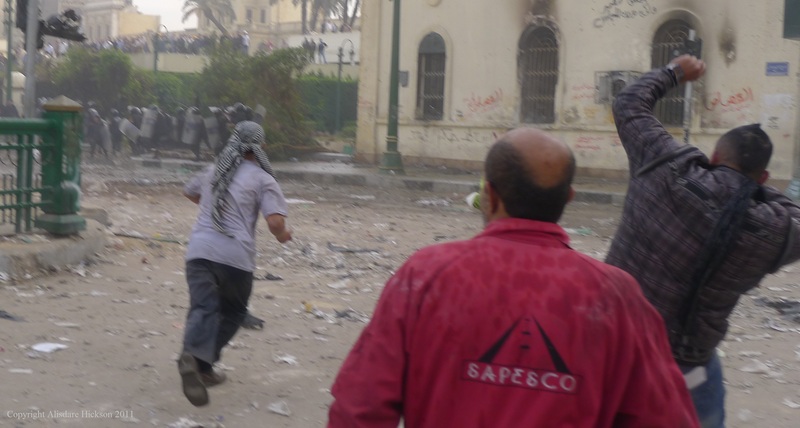 However it should be noted that some of the same media which headlined this act of arson had the previous day described the Egyptian Institute as a ministry building. 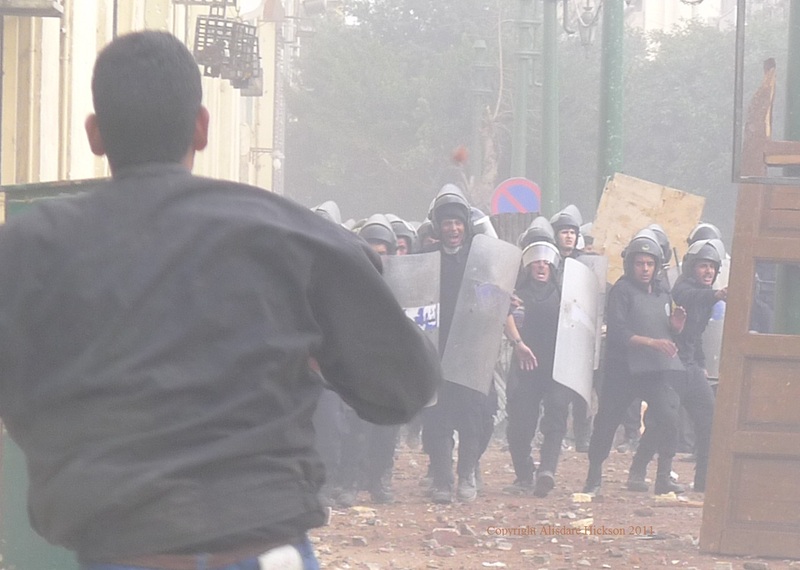 A large number of soliders stood by watching the stone throwing and the repeated acts of arson. 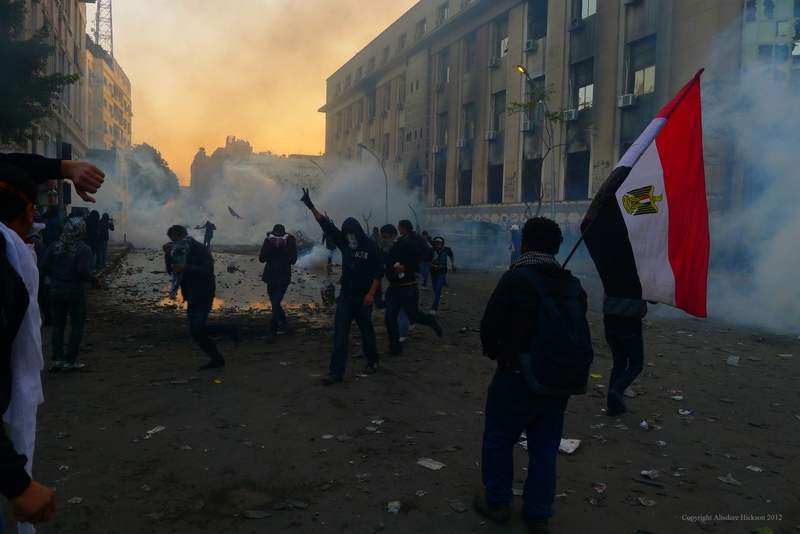 It wasn’t until two hours later that the security forces responded and then only to arrest and beat many innocent protesters in nearby Tahrir Square. 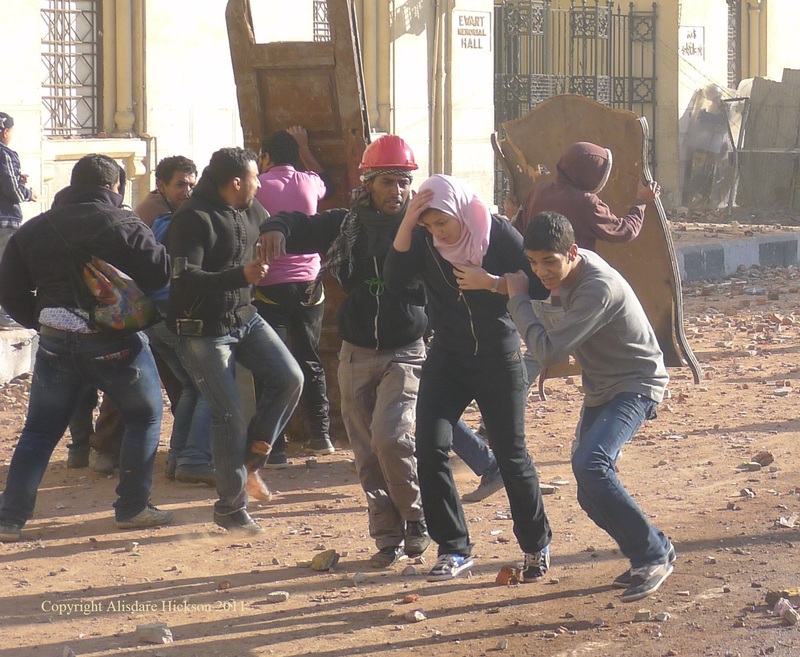 Apparent arson at the Egyptian institute – but by whom ? 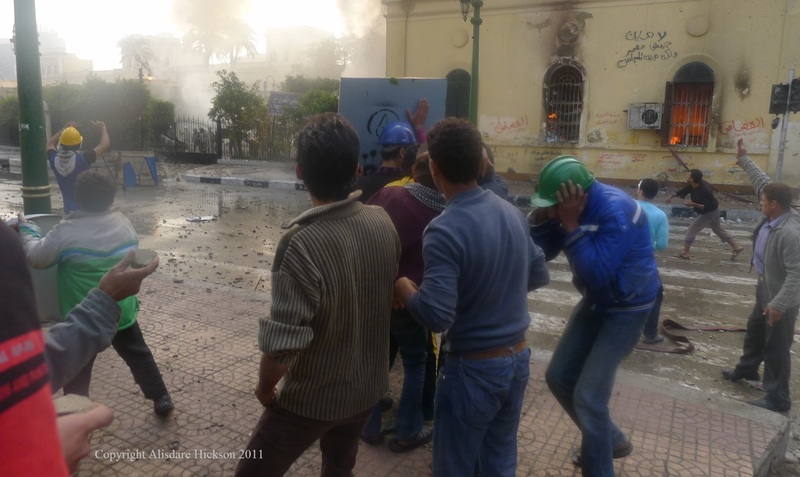 Just after 8am on the morning of 17th December 2011. 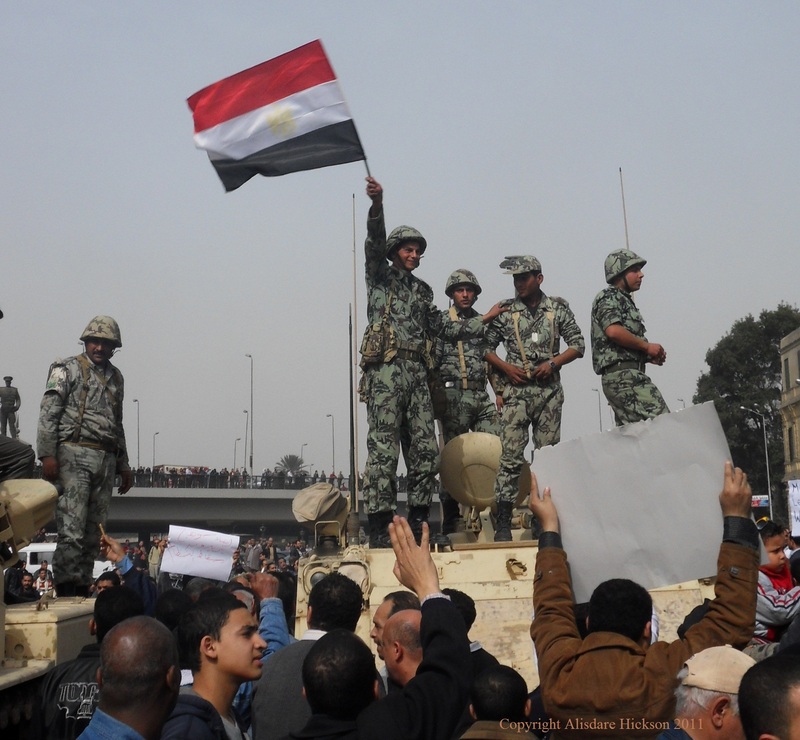 Notice the large number of soldiers in the background on the left. 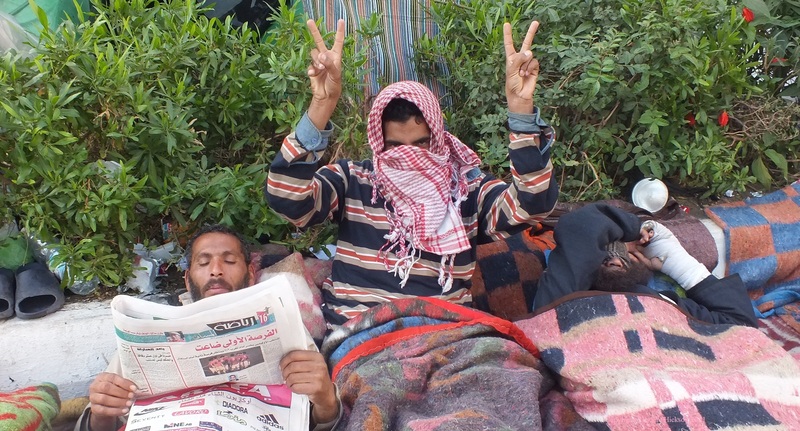 Morning 17 December 2011. 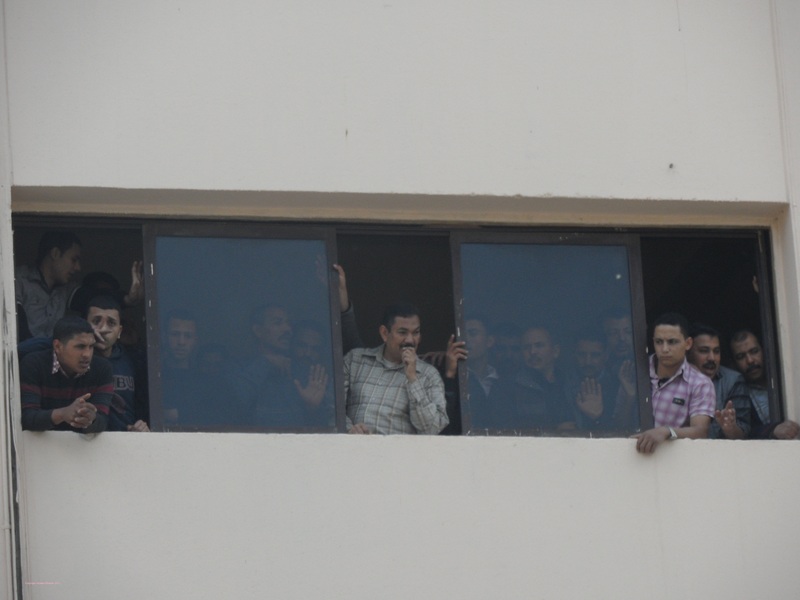 Shortly after 8am protesters watch with shock and amazement as militia hurl rocks and concrete slabs down from the rooftop of the Egyptian Institute. 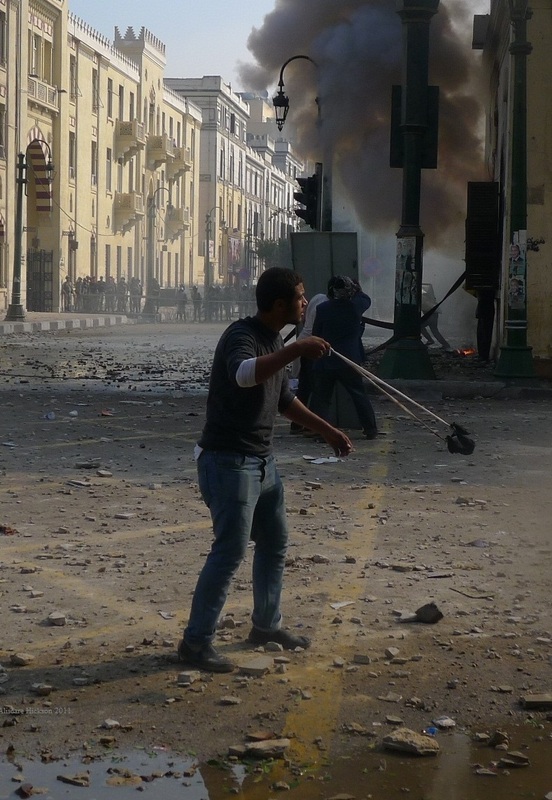 However some protesters also arm themselves. 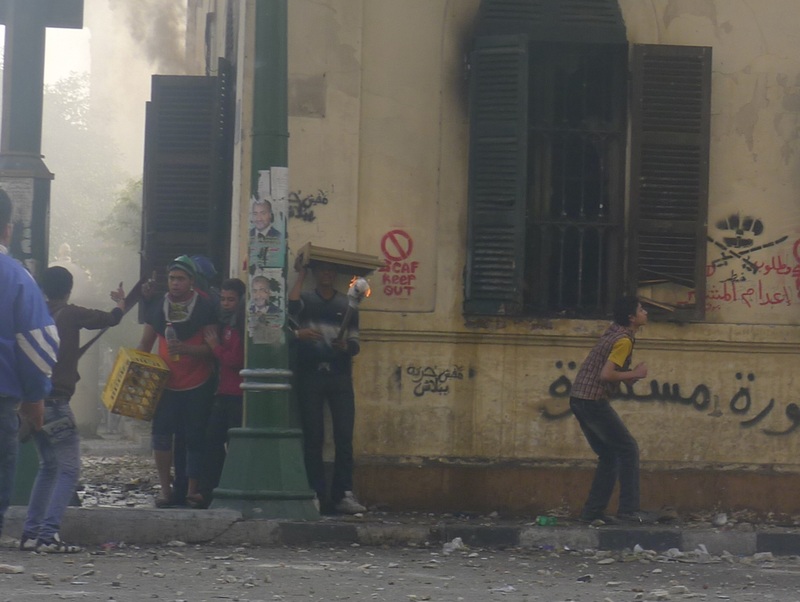 Some with rocks and also some hooligan or government infiltrators come with crates of petrol bottles to burn the Egyptian Institute. 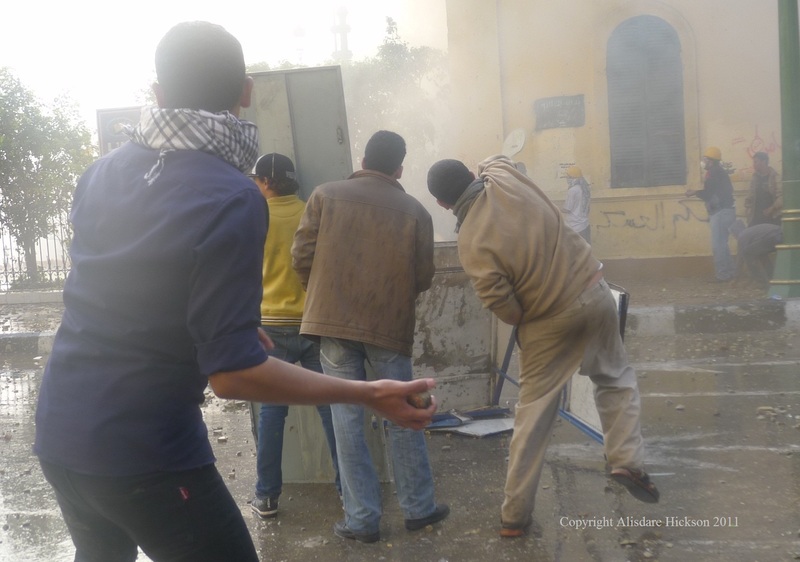 Man with sling v police with stones on the roof – Egyptian Institute on Kasr El Aisni Street – 17 December 2011. 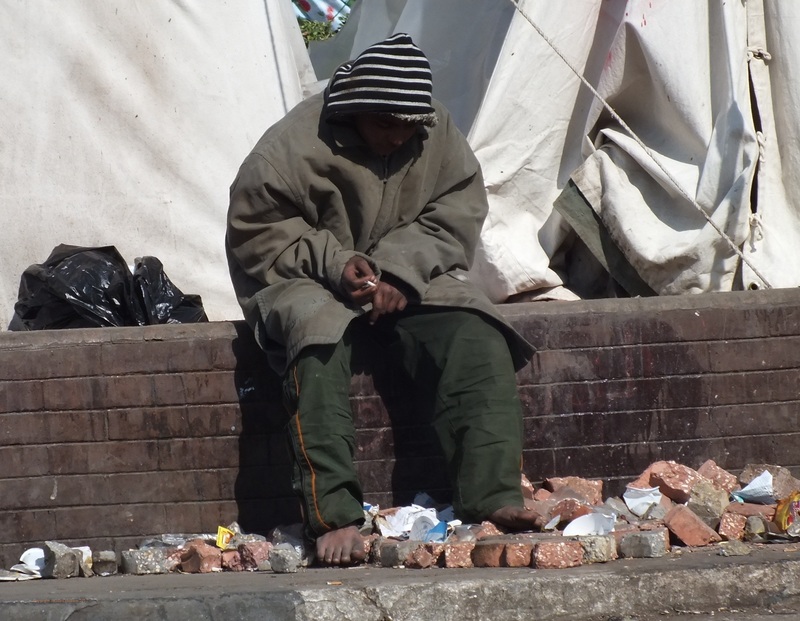 You’ll notice the ground is littered from stones thrown down from the roof. 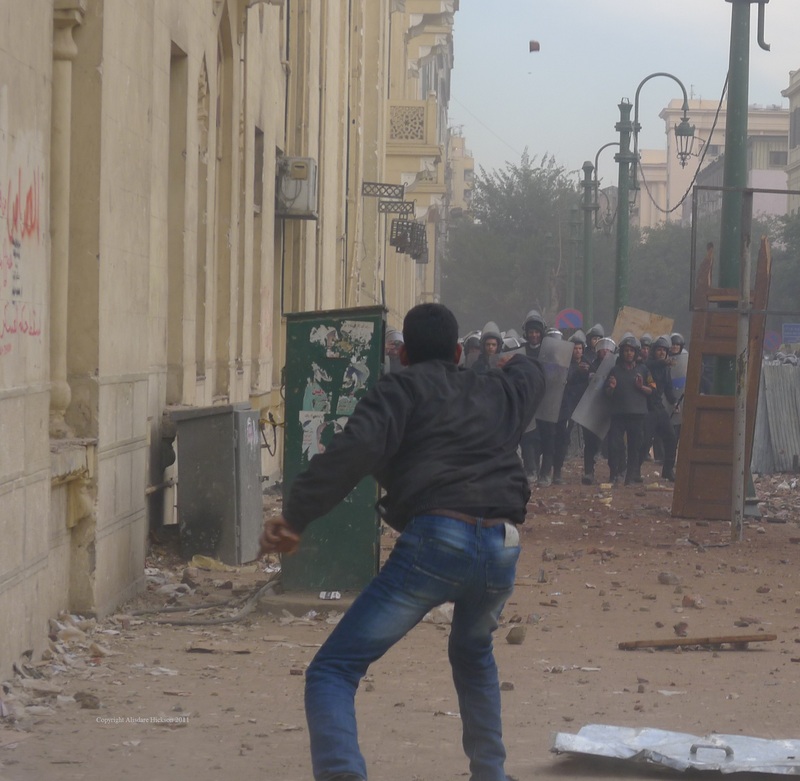 Protesters respond to stones thrown at them by security forces – 17 December 2011 – Just off Qasr El Aini Street, near Tahrir Square, Cairo. 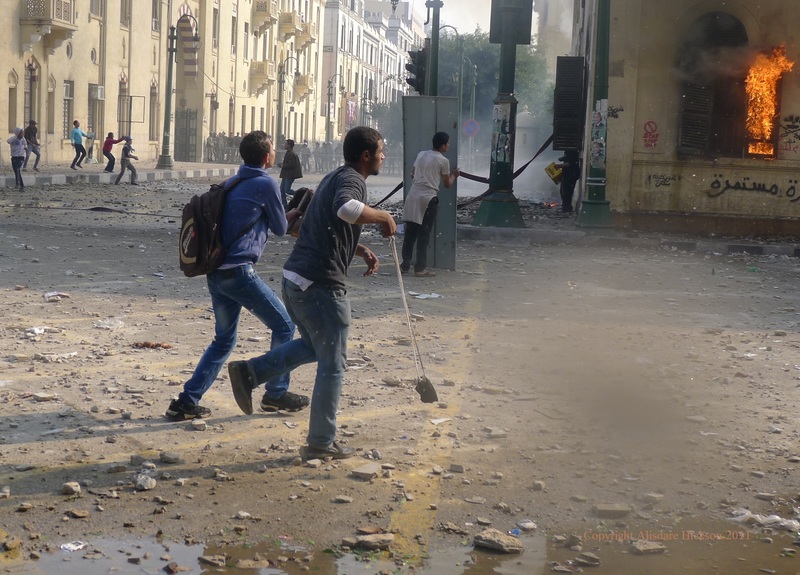 One man carries a large metal shield, a boy carries a satellite dish as a shield while a man points to the roof of the Egyptian Institute which is one of several roofs from which security forces hurl rocks and stones at protesters. 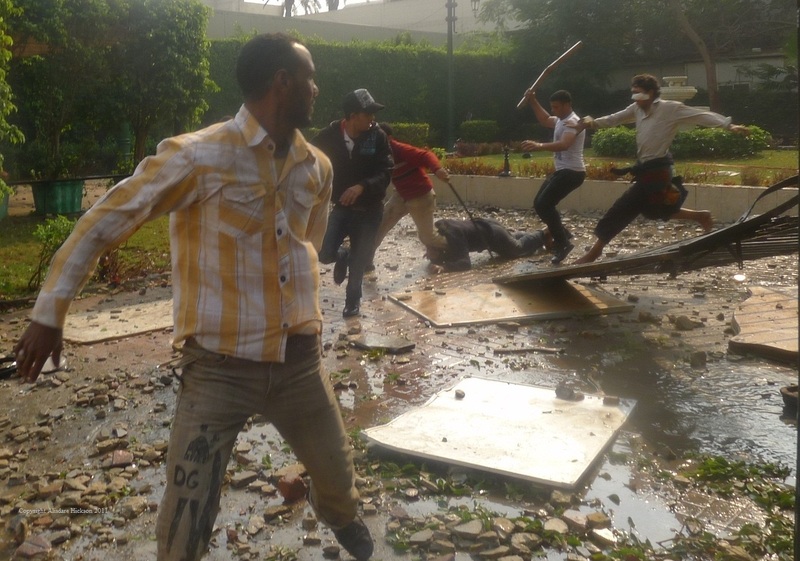 Some protesters threw stones back. 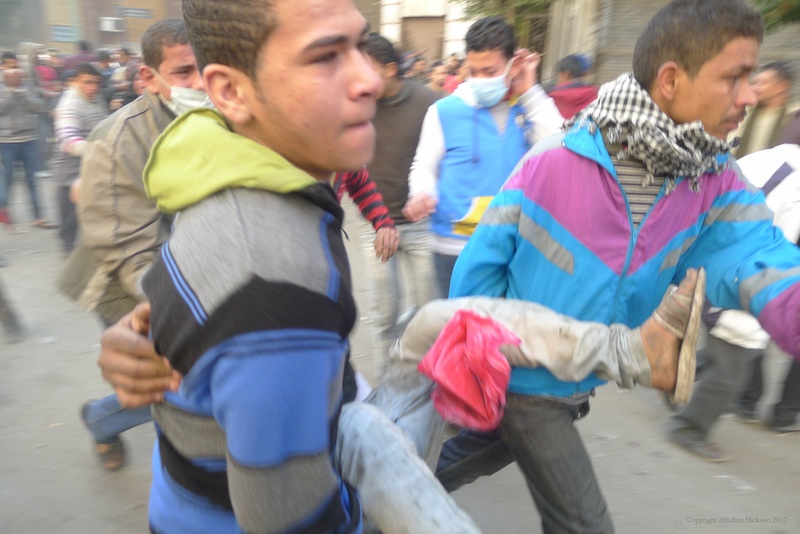 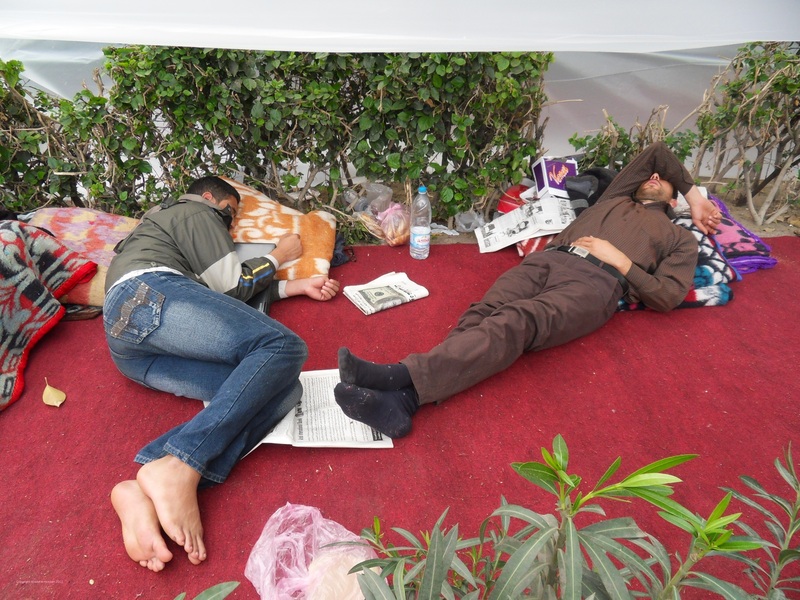 Three hours after fatal shootings in Tahrir Square. 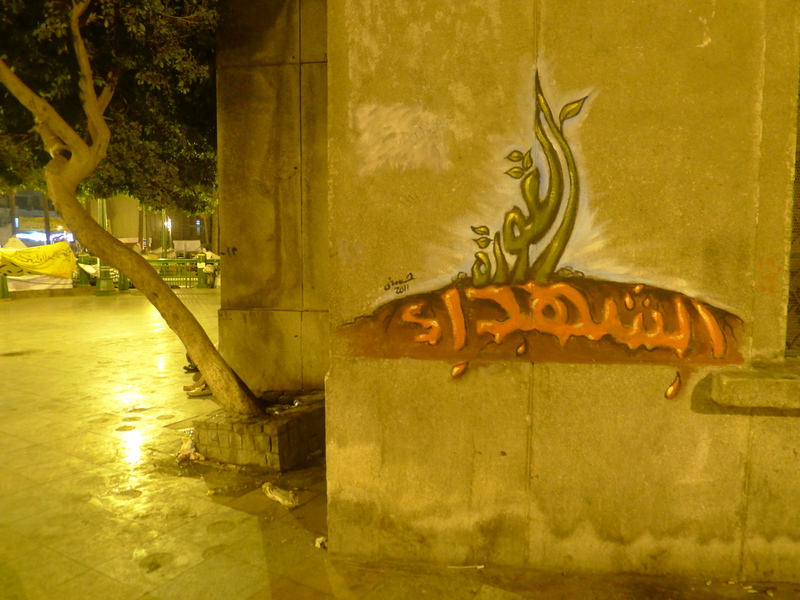 Morning Tuesday 20 December 2011. 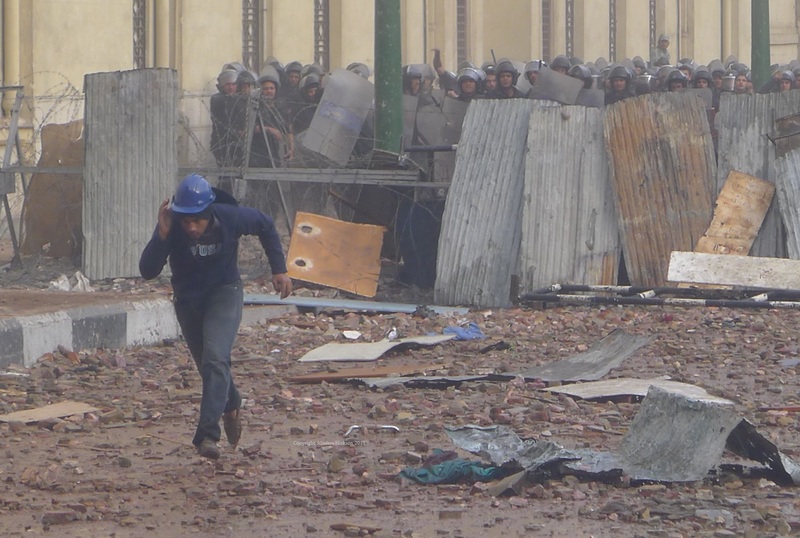 There was a large trail of blood perhaps around six metres or more long where the man had presumably first fallen and then been carried along. 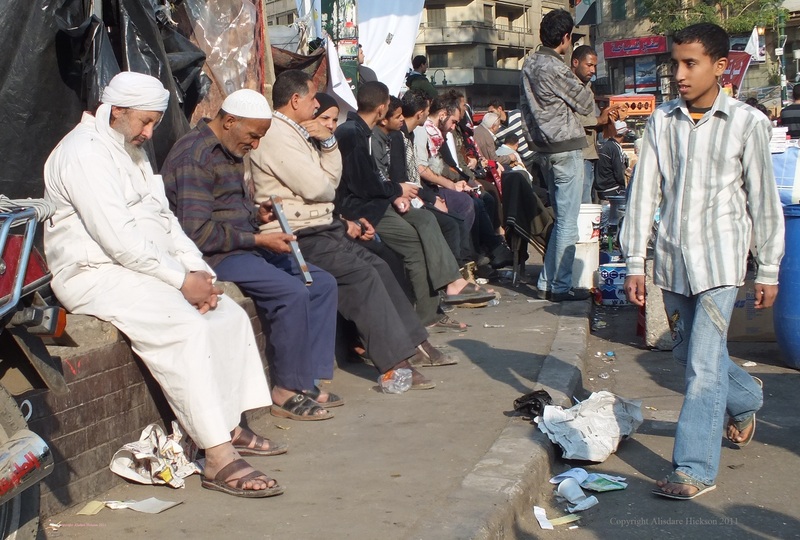 The young man sitting was the man’s friend. 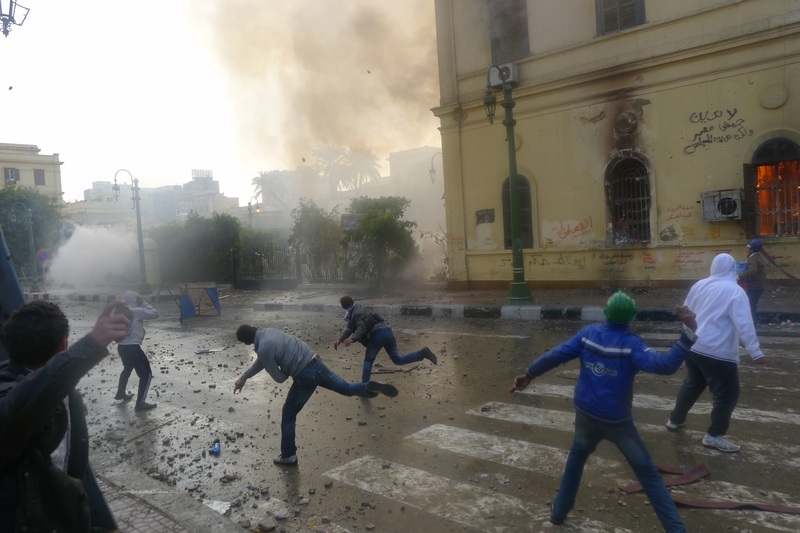 This photo was taken around 7am about three hours after the fatal shootings. 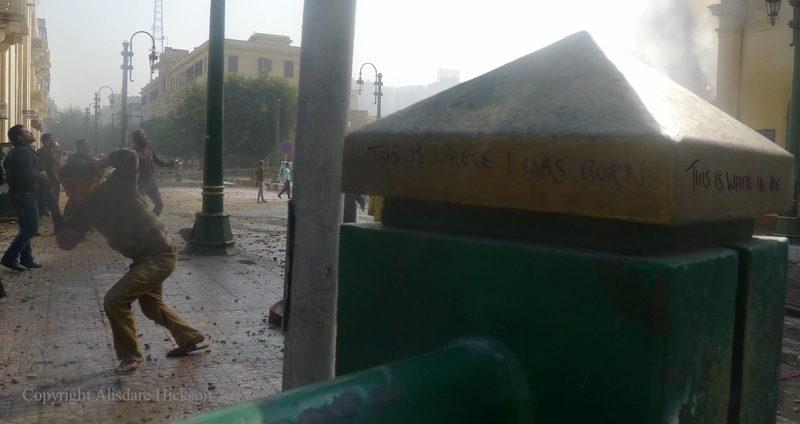 Soon afterwards that morning the blood was washed away. 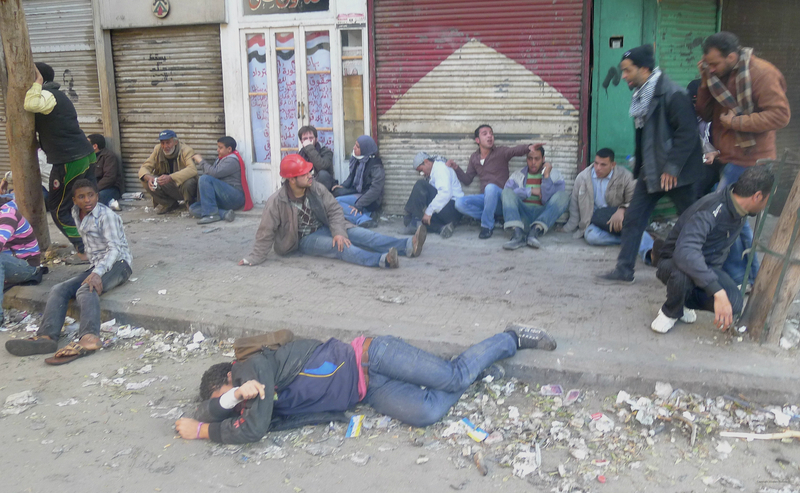 Three hours after claimed fatalities in Tahrir Square. 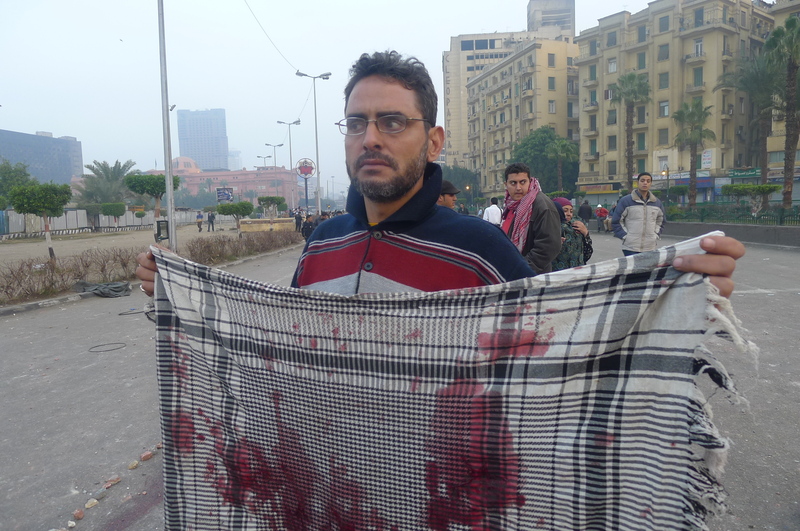 It’s not certain whether the man wearing this scarf was killed or seriously wounded. 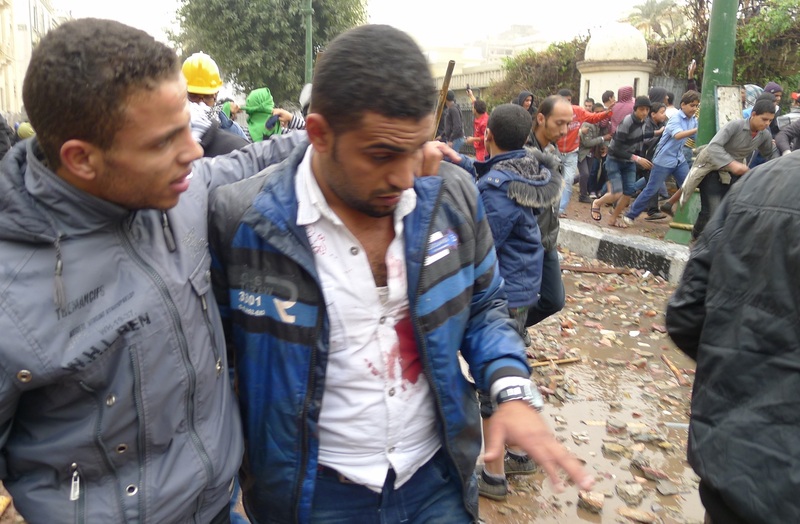 People at the scene claimed he had been killed but I am still waiting for any definite news. 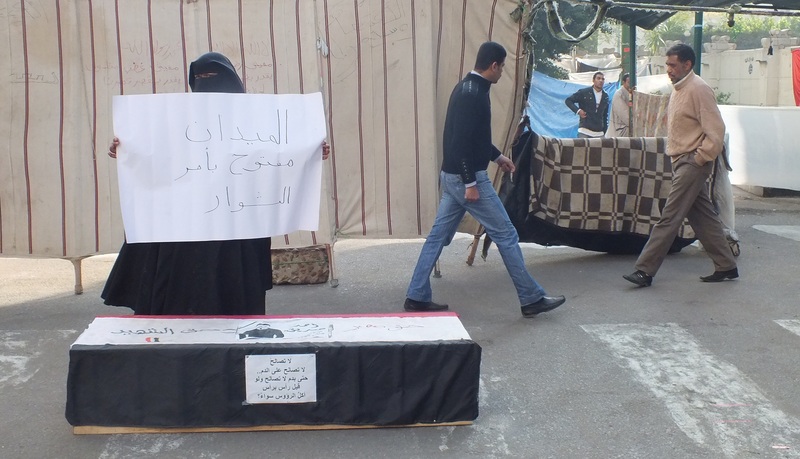 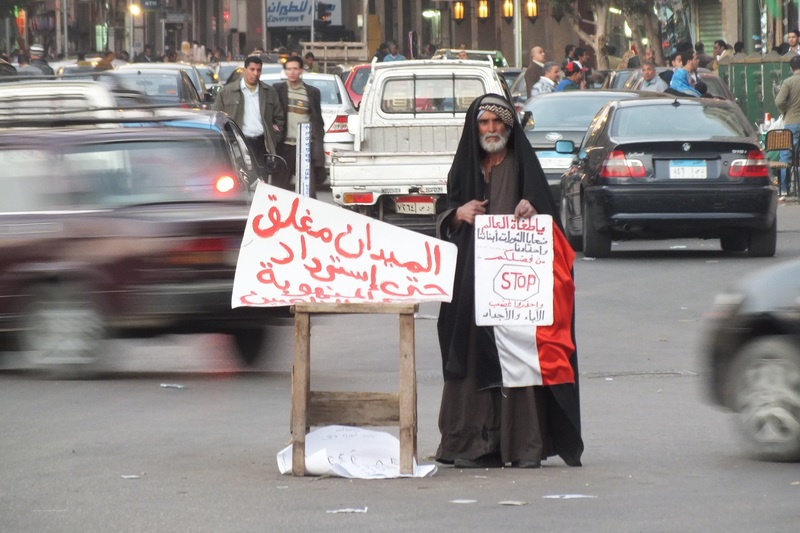 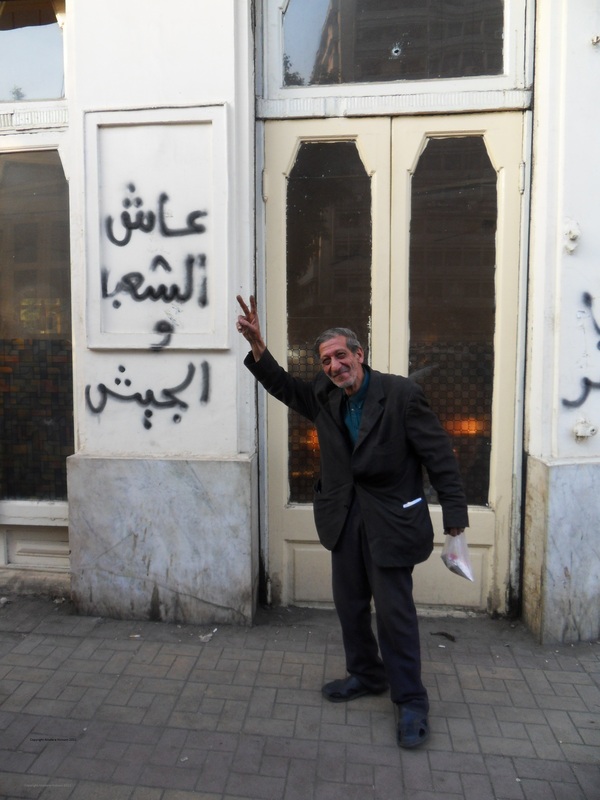 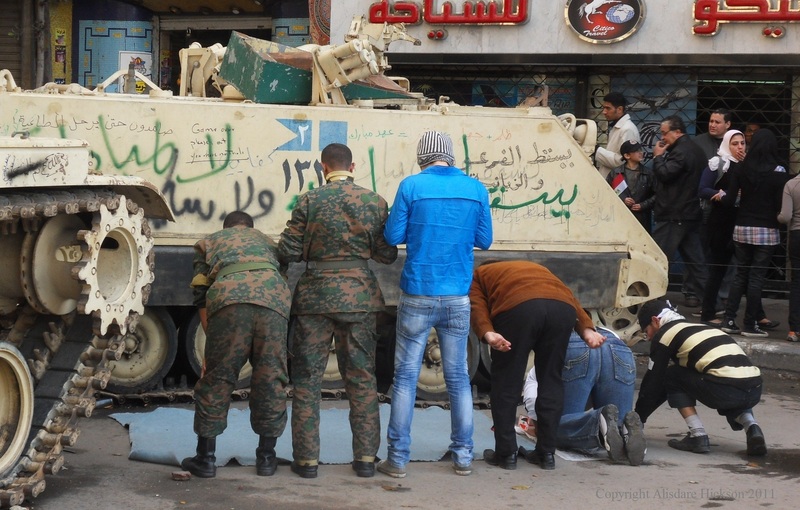 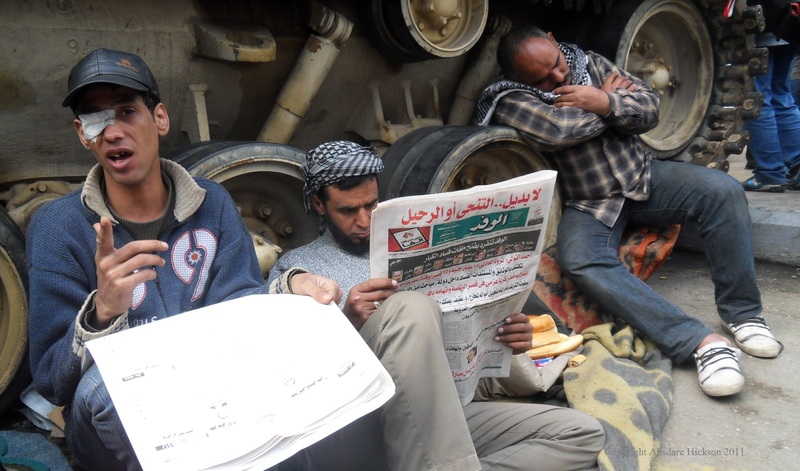 This photograph taken Cairo 20 December 2011. 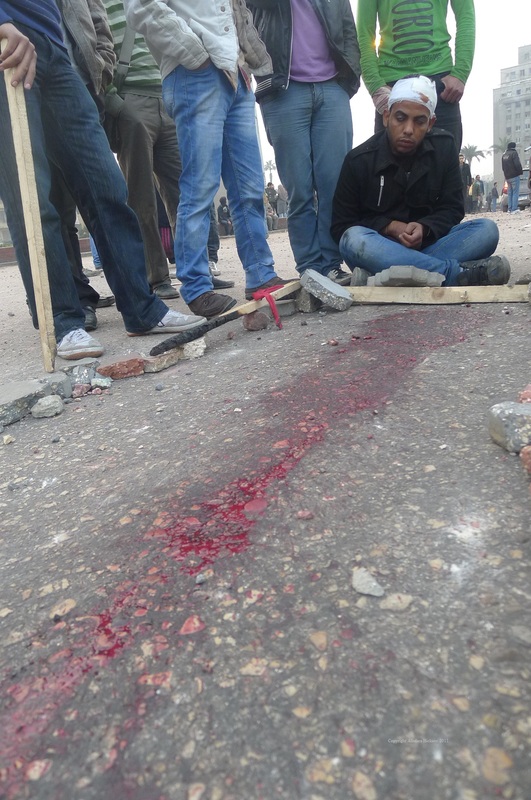 Murder in Tahrir Square. 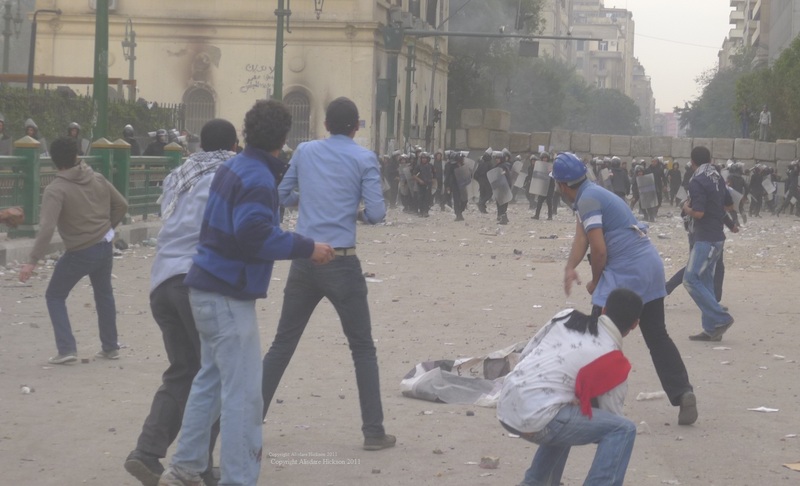 20 December 2011. 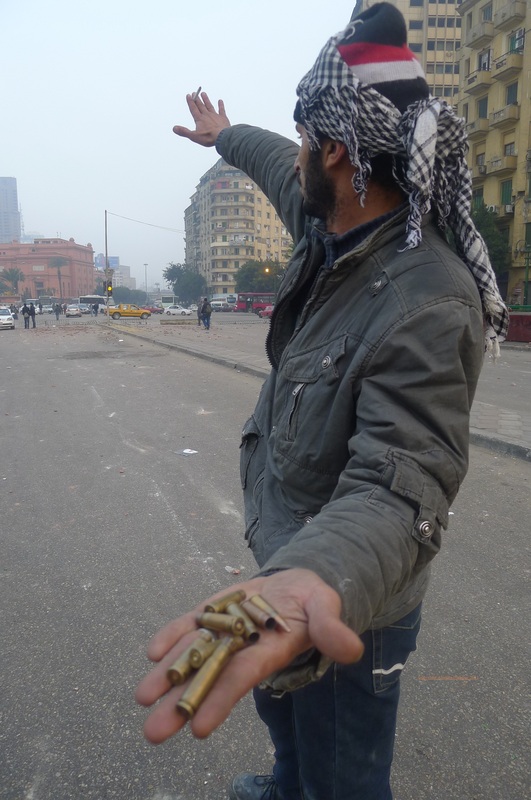 These were bullets protesters claimed where used by the security forces between 3am and 5am Tuesday morning killing according to news sources 4 men and critically injuring one 15 year old boy. 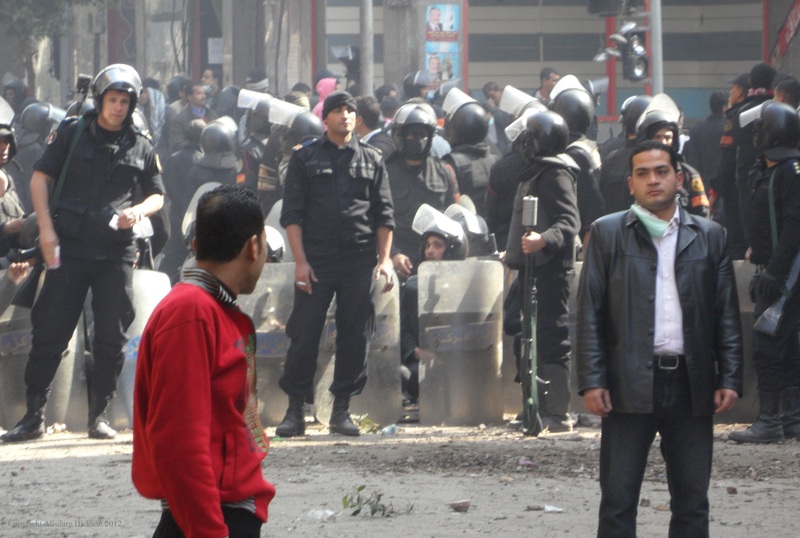 Protester faces off state security officer on Mohamed Mahmoud Street – Cairo – 4 February 2011 – the next day I was arrested. 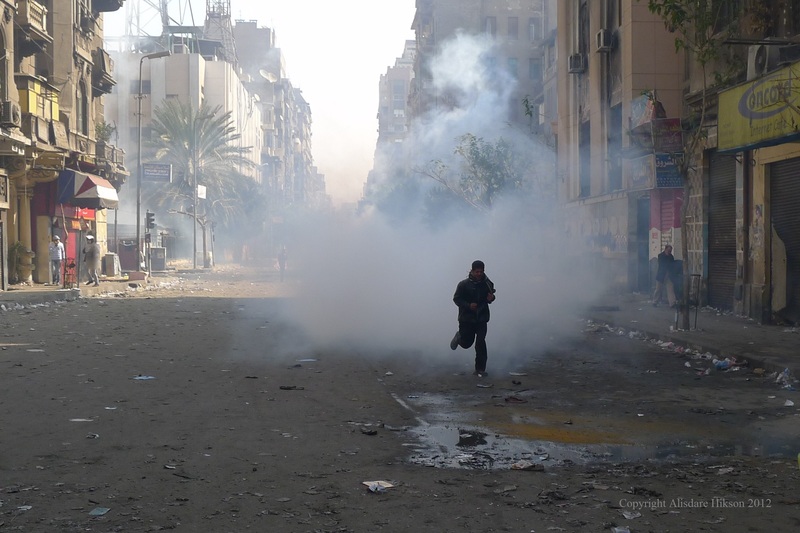 Protester runs from the tear gas afternoon 4th February 2012 – Mohamed Mahmoud Street – Cairo. 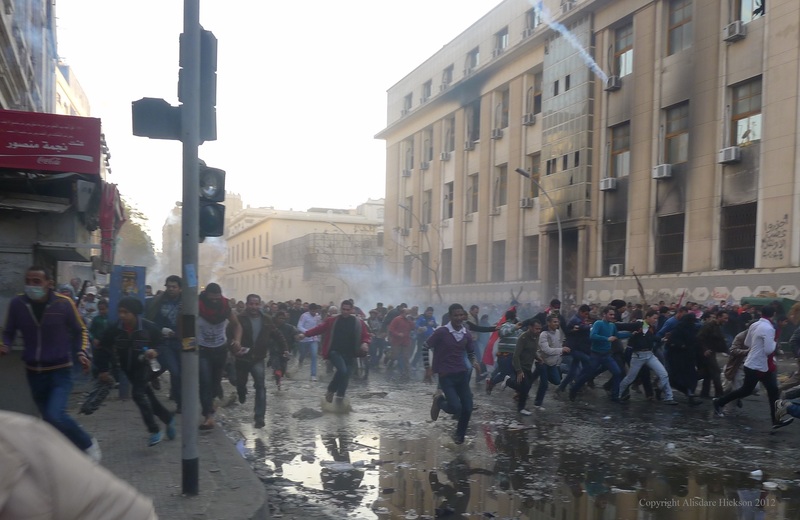 A crowd stampedes with fear as tear gas cannisters including one visible above right rain down. 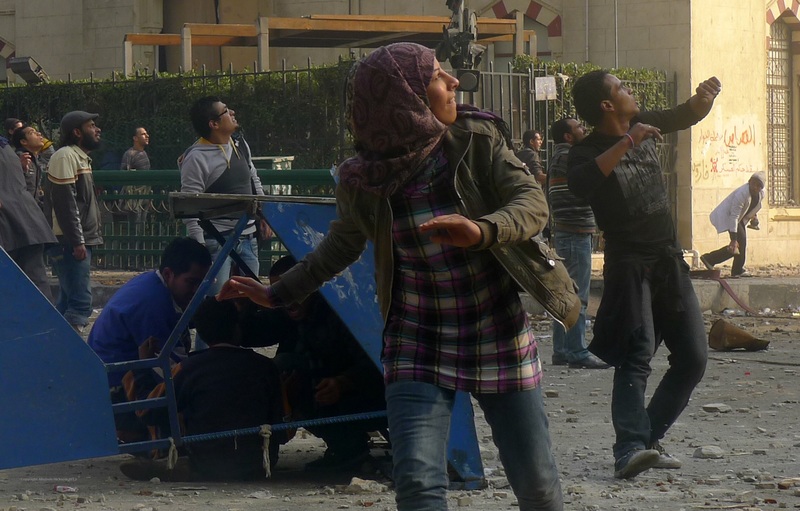 Afternoon 4th February 2012 on the junction of Mohamed Mahmoud Street and one of the main roads leading to the Interior Ministry Building. 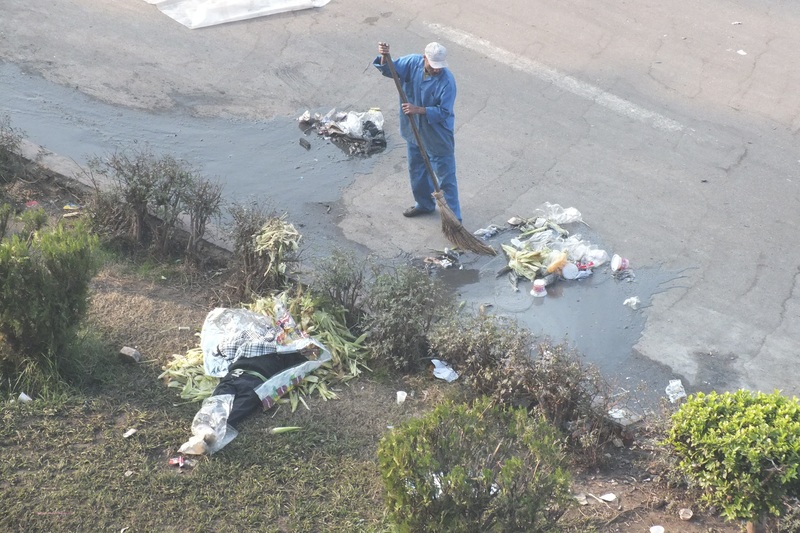 The water on the road may have been from that used to try to put out the fire at the nearby tax office about two days earlier. 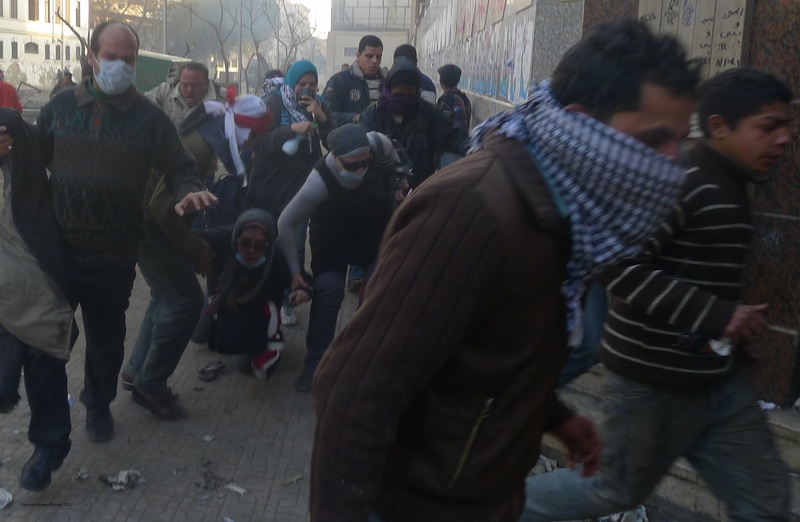 Crowd continues to flee Mansour Street into Mohammed Mahmoud Street – 4 February 2012. 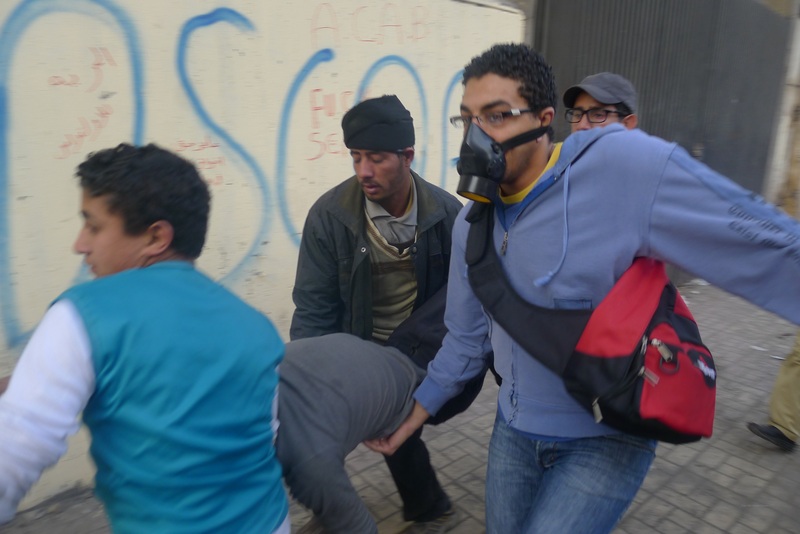 Tear gas casualty carried away – photo 2 – 4 February 2012. 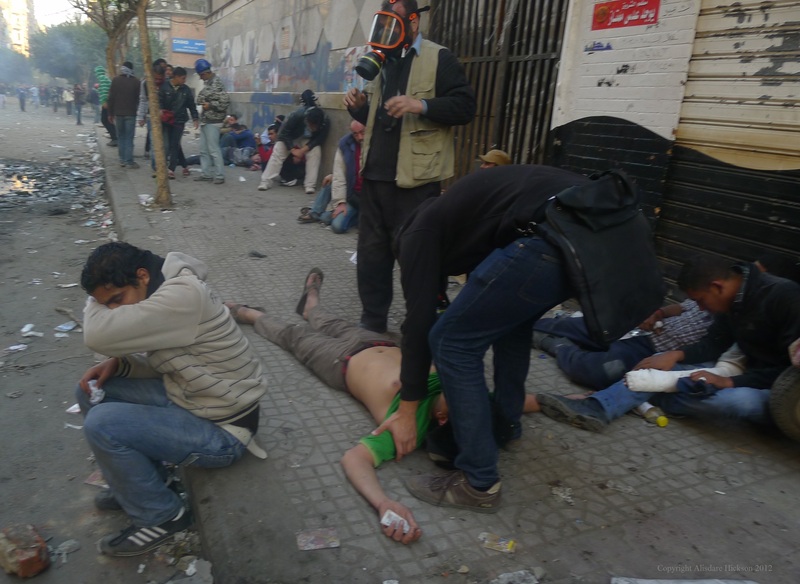 The immediate effects of highly toxic tear gas used by the police on Mohamed Mahmoud Street – Cairo – Afternoon 4th February 2012. 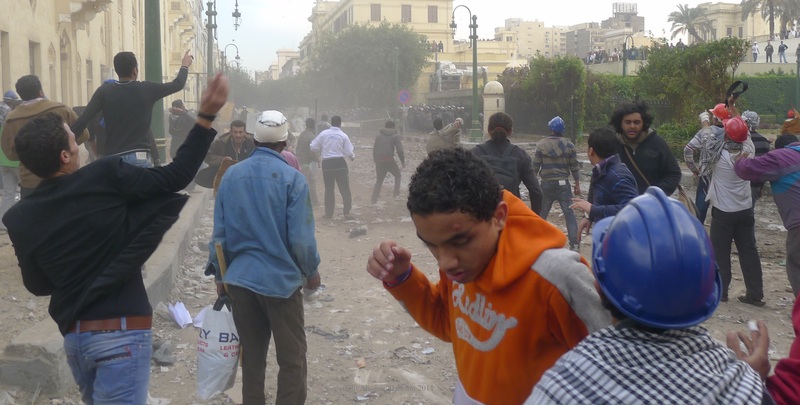 Immediate effects of highly toxic tear gas – second photo – 4 February 2012. 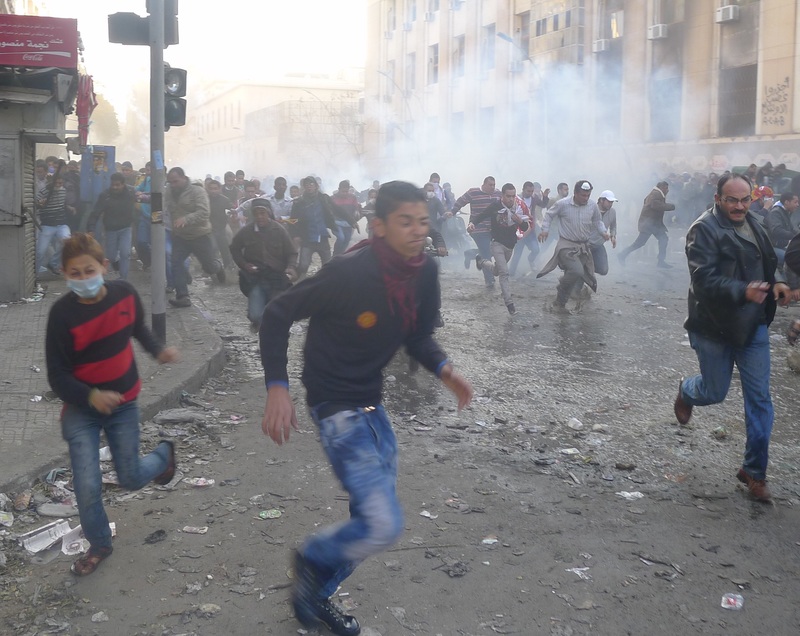 The tear gas effected hundreds of protesters. 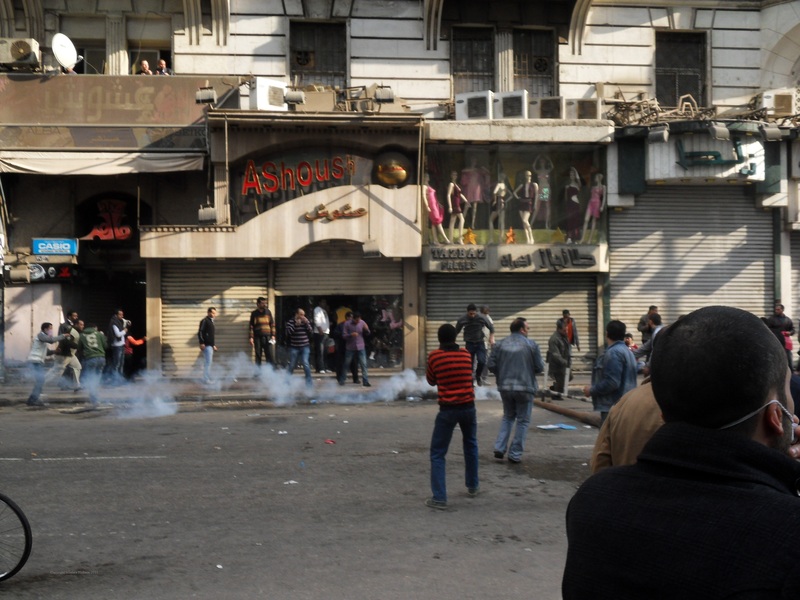 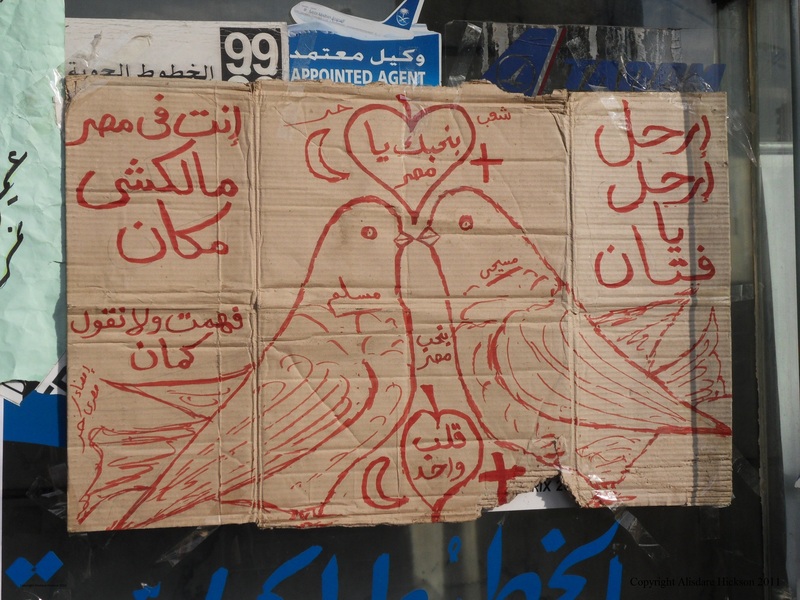 Mohamed Mahmoud Street – Cairo – 4th February 2012. 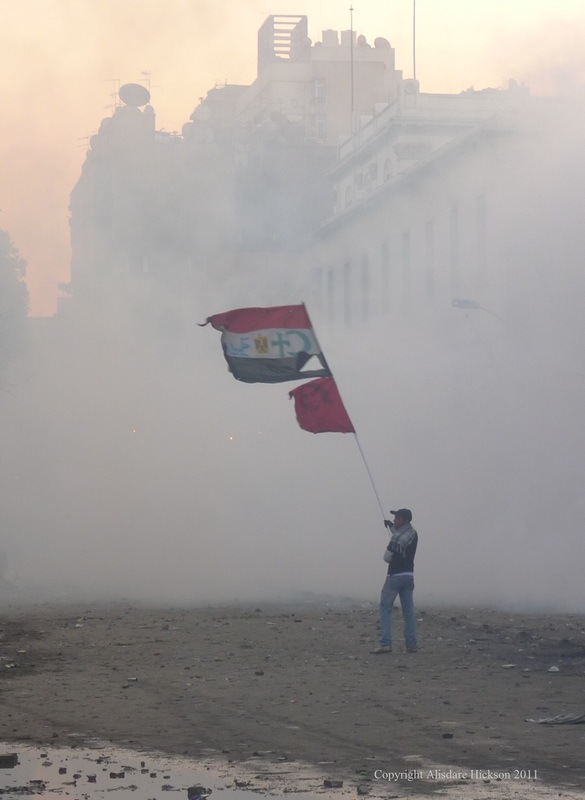 Protesters on Mansour street at sunset 4 February 2012 – one in the distance still waving the Egyptian flag amidst tear gas attack near Egypt’s Ministry of Interior – the next day I was arrested. 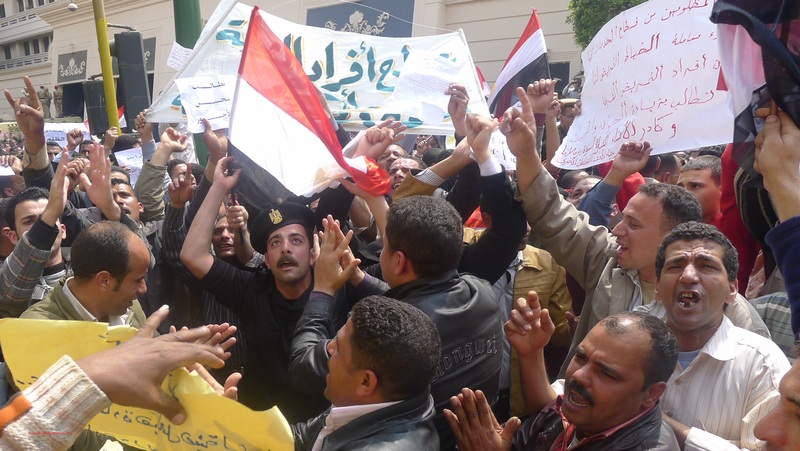 A protester defiantly waves an Egyptian flag with the emblems of Christianity and Islam (the cross and the crescent) added – a message of religious unity. 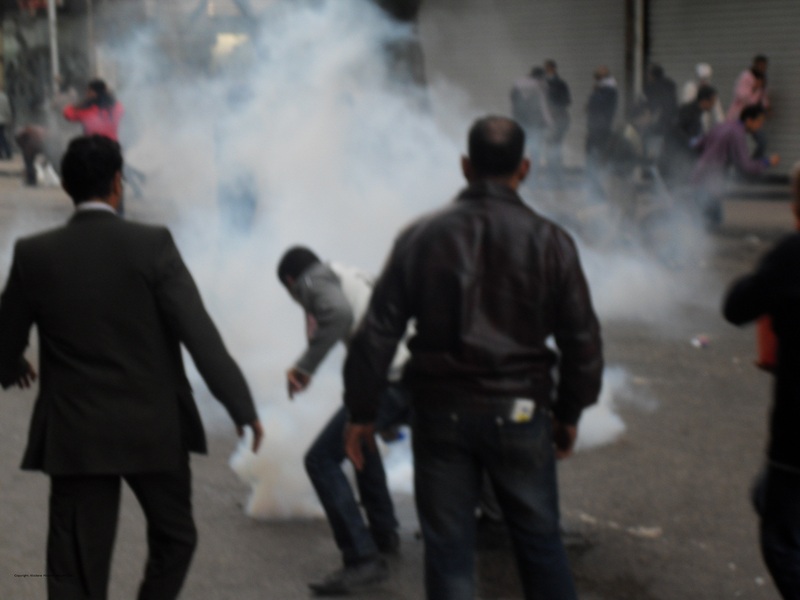 Clouds of tear gas in the background. 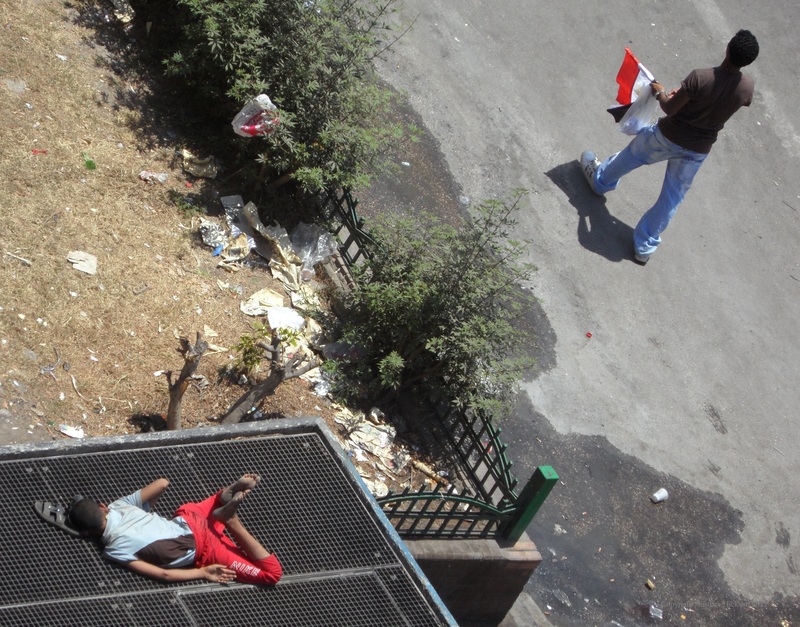 The flag waver was said to have been a relative of one of those who died at Maspero. 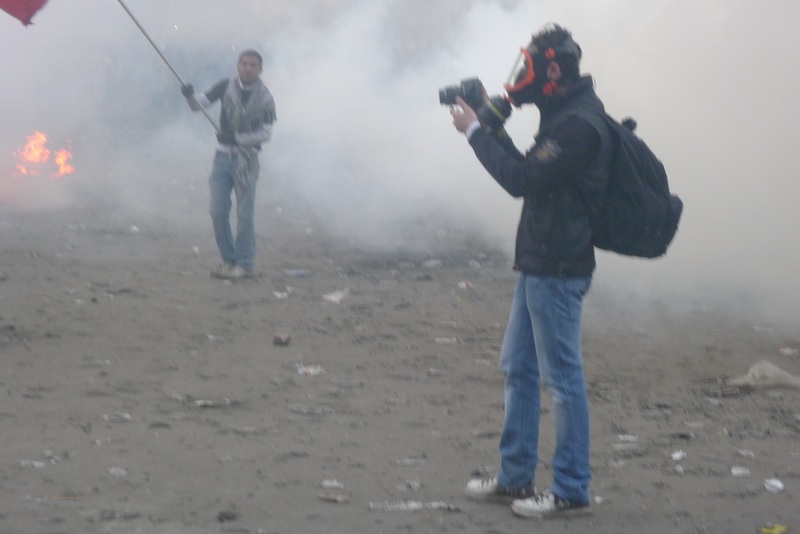 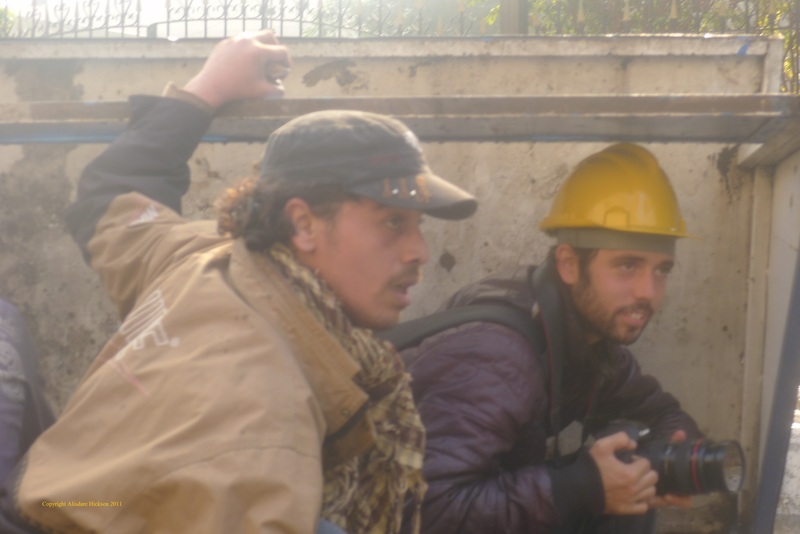 Journalist wearing gas mask on Mansour Street – 4 February 2012. 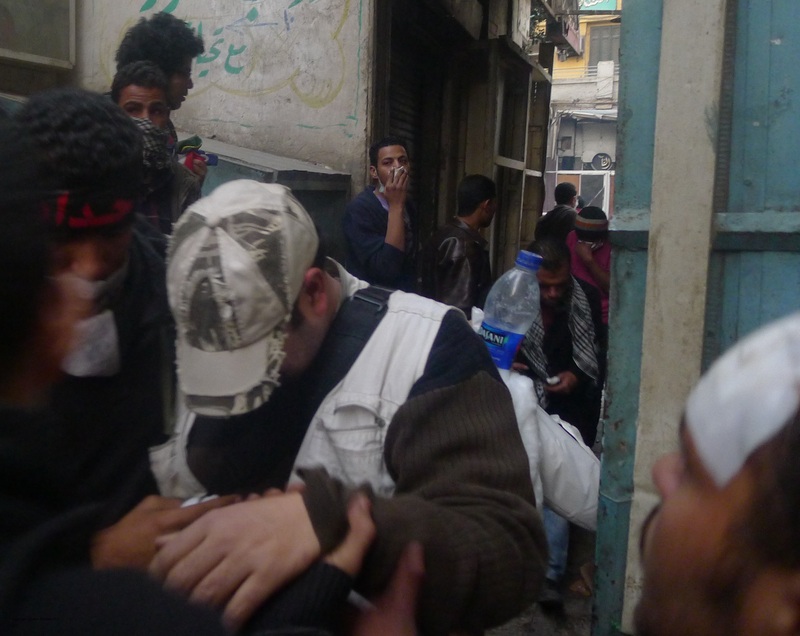 Falaky Doctor’s Field Hospital at dusk 4 February 2012 in a narrow alleyway running between Mansour and Falaky Streets. 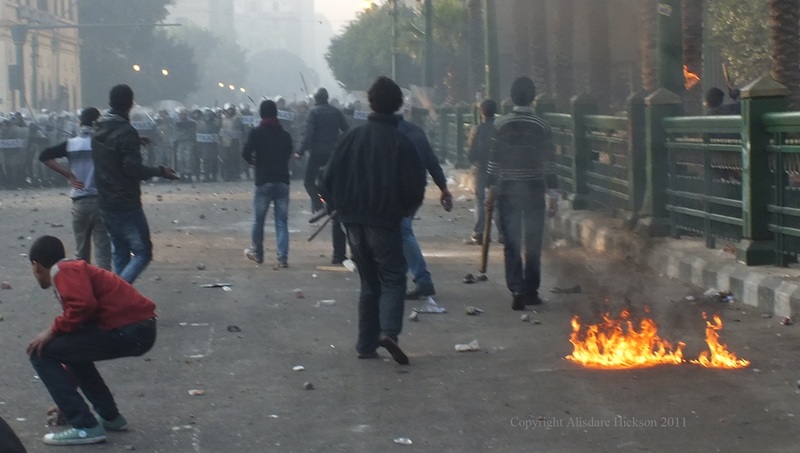 This photo is the last I took before I was arrested the next day – 5 February 2012.